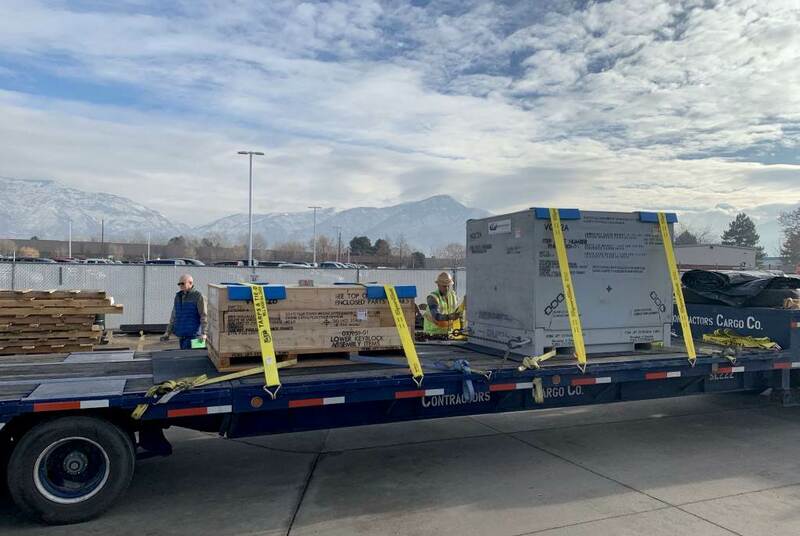 Elements of the central solenoid support structure—lower key blocks—are loaded at Petersen Inc. in Ogden, Utah (US) for delivery to ITER. 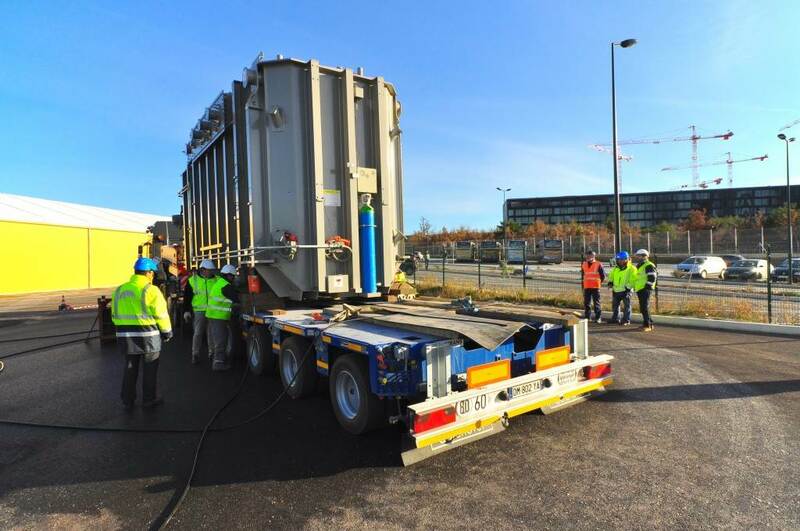 For this cryogenic termination cold box to reach ITER from Switzerland, it must travel 2,000 km through the waterways of Europe under the guidance of ITER's logistics transporter DAHER and its contractor Compagnie Fluviale de Transport. 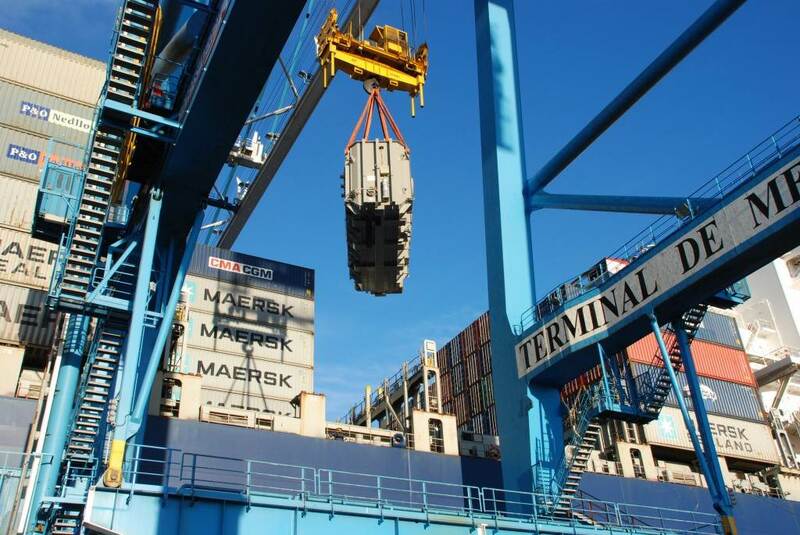 A 63-tonne component (a cryogenic termination cold box) procured by the Indian Domestic Agency is on its way to Basel harbour, from the Linde Kryotechnik factory near Zürich. This "cold" component is part of ITER's cryodistribution system. 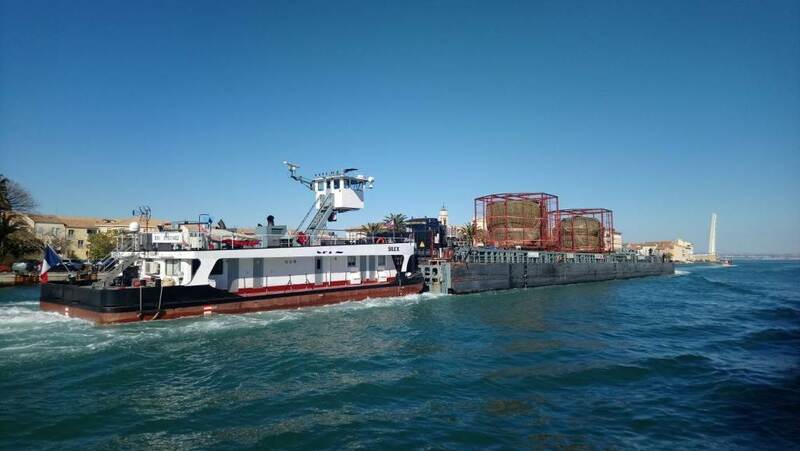 Four transformers travelled by barge along the Canal de Caronte, a waterway that connects the Mediterranean Sea to an inland sea called Berre l'Etang. 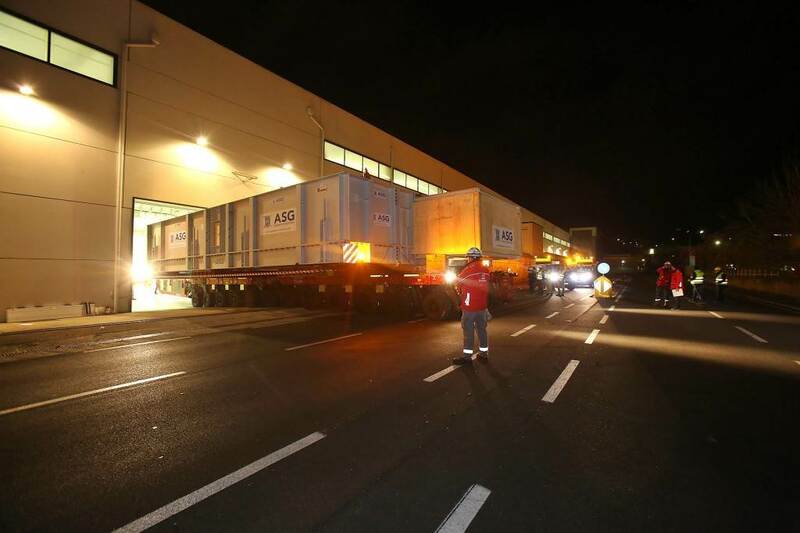 The four transformers—one shipped by China and three by Korea—will reach ITER on 23 November. 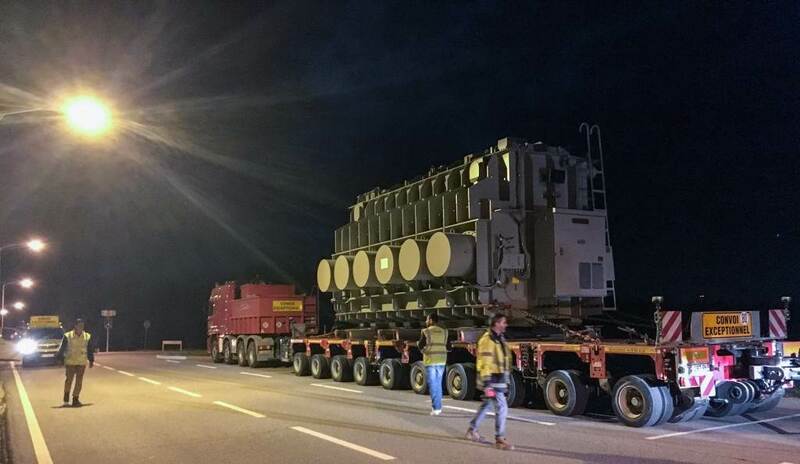 A few hours before dawn on 30 May, a convoy of three converter-transformers reaches the ITER site after three nights of travel along the 104-kilometre ITER Itinerary. 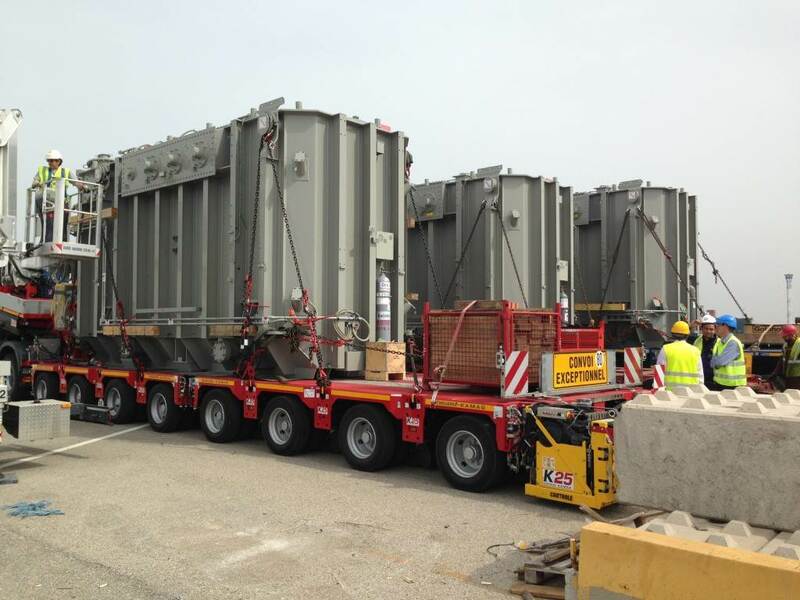 The 90-tonne units were procured by Korea for ITER's magnet power conversion system. 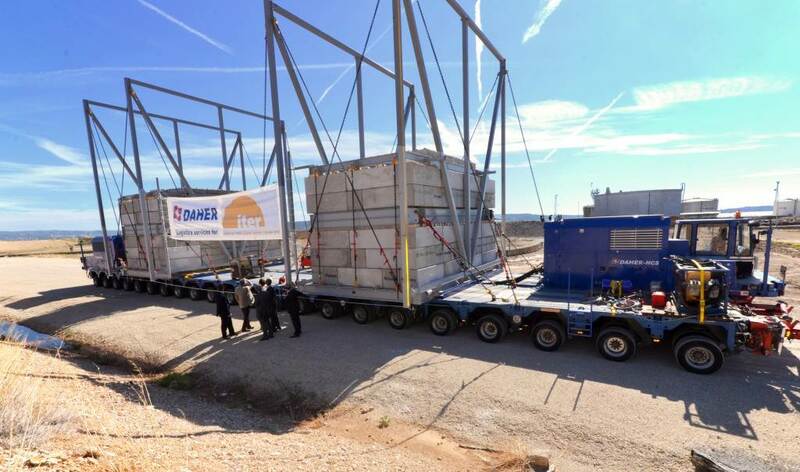 Late May, two small holding tanks and two larger feed tanks are delivered by the European Domestic Agency for the ITER water detritation system. 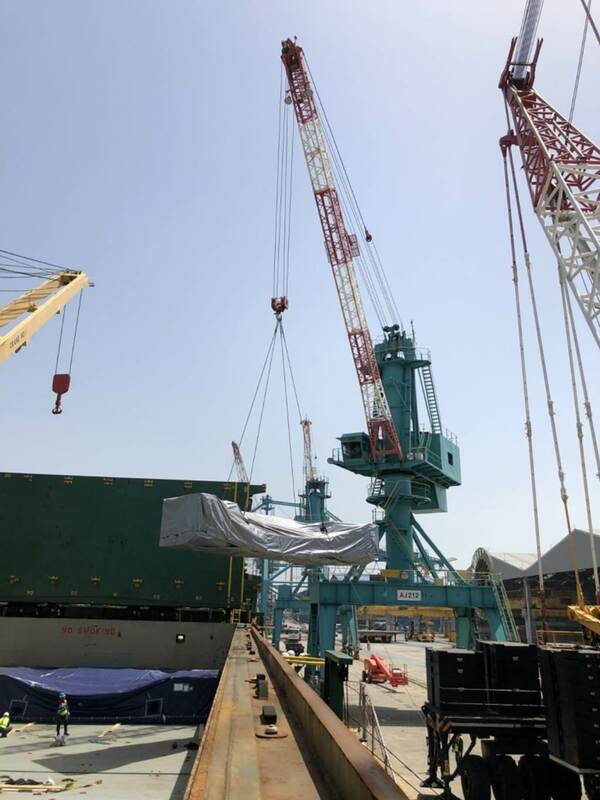 Segments of a 190-tonne steel toroidal field coil case leave Ulsan, Korea, for Venice, Italy. Japan is procuring 19 coil cases through Japanese and Korean contractors; Europe is receiving ten of these for assembly with superconducting toroidal field winding packs produced by contractors in Italy. 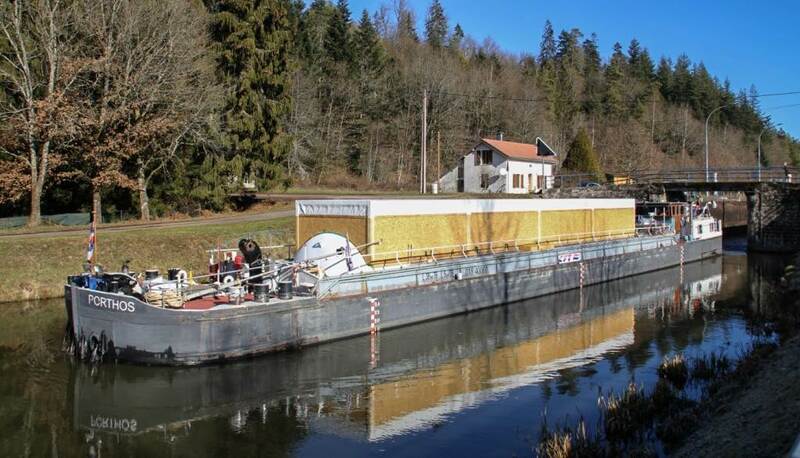 On 23 April, a 35-metre-long tank is moved from storage to be installed near the cryoplant. It is one of two designed to hold helium from the Tokamak's magnetic system in case of a sudden loss of superconductivity (a quench). Two transformers for the magnet power conversion system arrive from Korea in January and are immediately installed on site. 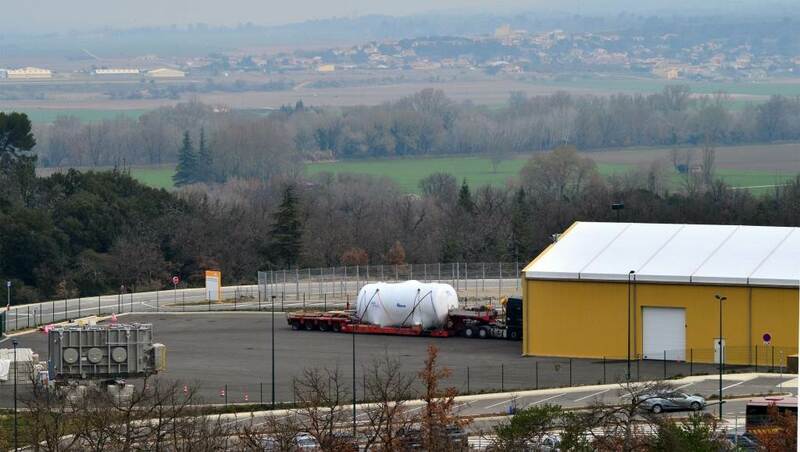 The last of the tier two segments for the lower cylinder of the cryostat arrive at the ITER site. 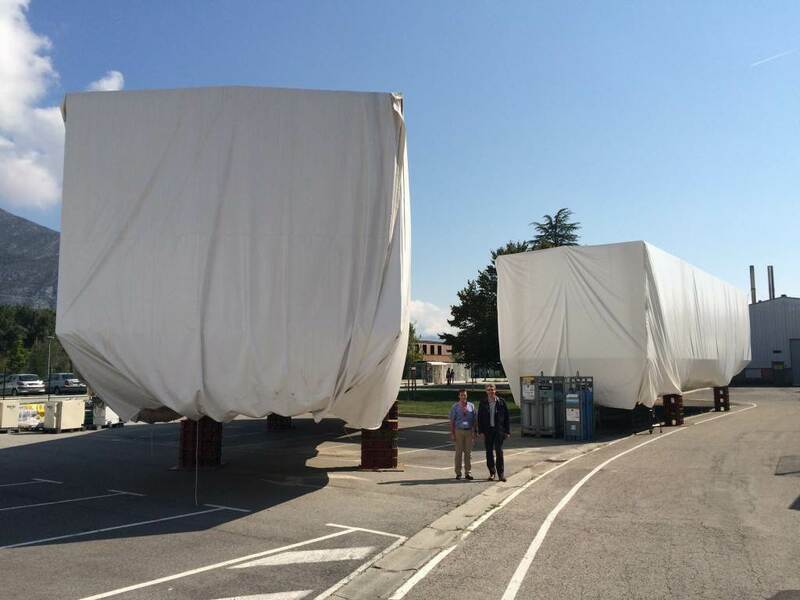 The first European winding pack for ITER's toroidal field coils leaves the ASG facility in La Spezia, Italy on 20 November. 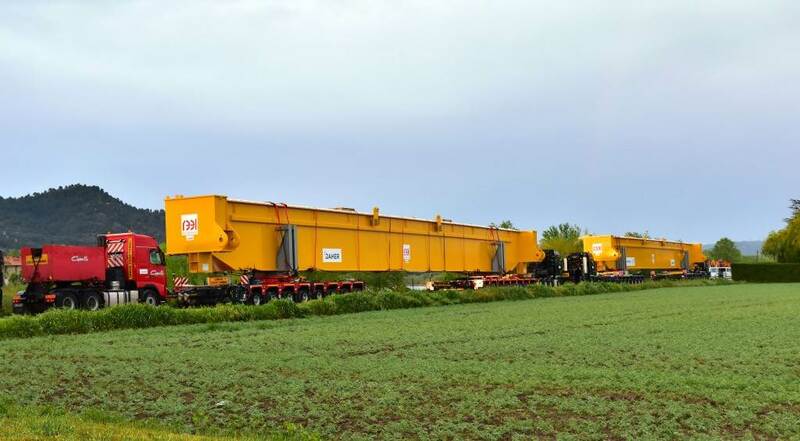 The 110-tonne component is en route to SIMIC SpA for cold testing and insertion into a steel case. 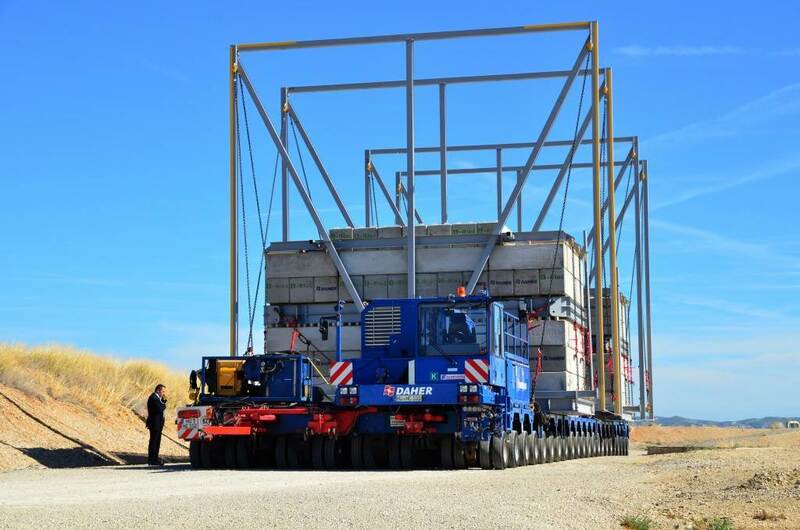 Second-tier segments for the lower cylinder of the cryostat make their way along the heavy haul road that leads to the platform. 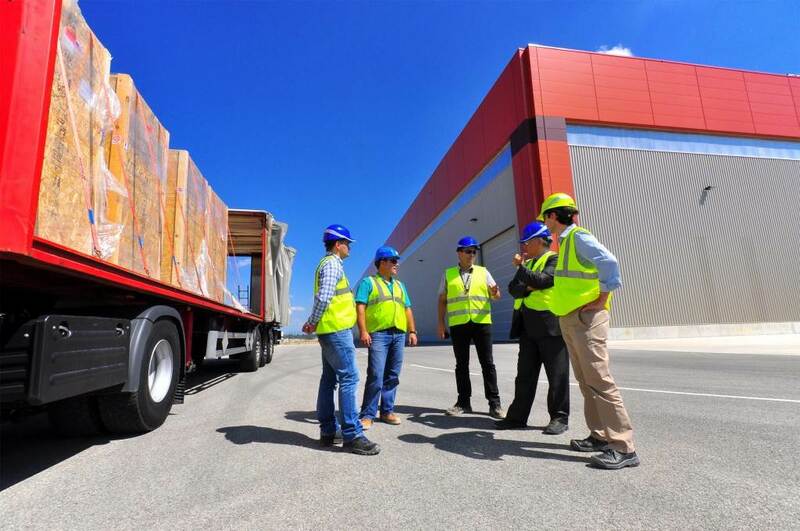 The first segment of one of ITER's 31 magnet feeders has arrived from China and been delivered to the MIFI facility (Magnet Infrastructure Facilities for ITER)—a workshop operated by a joint team from ITER and the French Alternative Energies and Atomic Energy Commission (CEA) to develop and qualify the ITER magnet elements and their assembly procedures. Testing is underway. 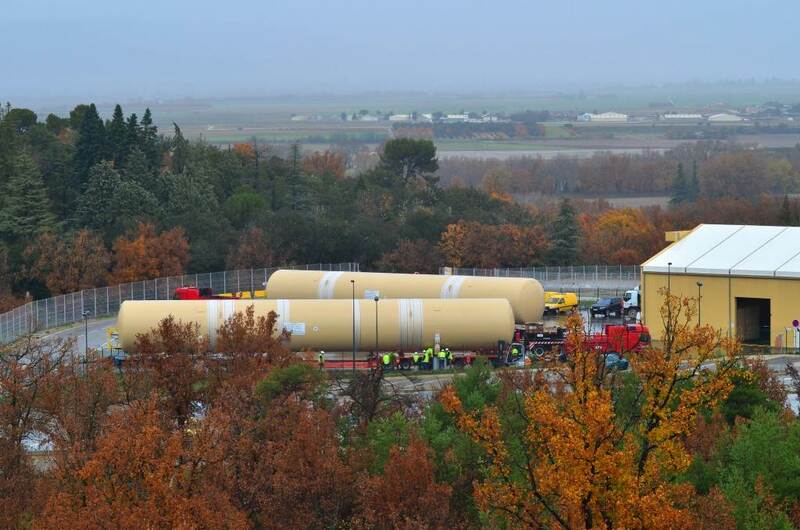 With Europe's delivery of the last two tanks in October (of eleven), all of the storage tanks for liquid and gaseous helium and nitrogen are now at ITER. They will be installed near the cryoplant in the coming months. In this wooden case, an important realization for the SPIDER testbed in Padua, Italy (Consorzio RFX): the negative ion beam source, manufactured in Europe. 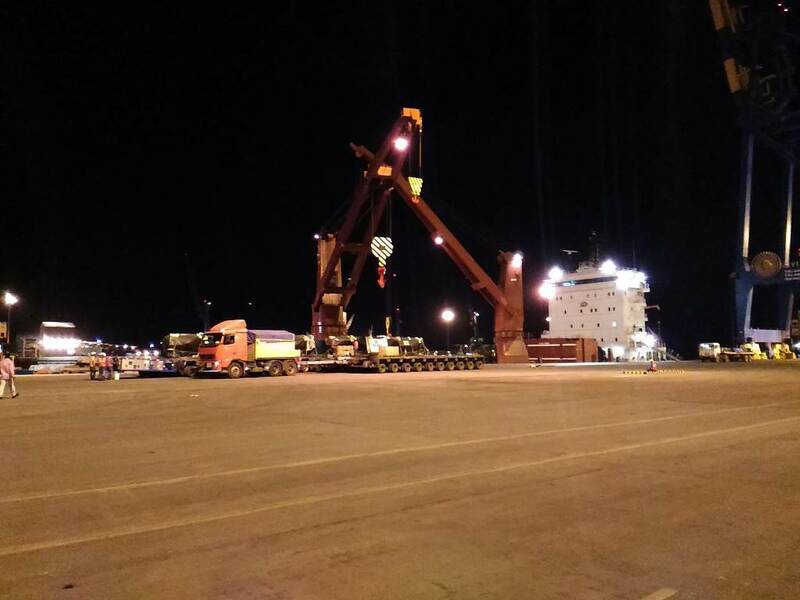 On 1 October, seven large segments of the ITER cryostat left the port of Hazira, India, for their ocean crossing to France. These segments, weighing approximately 190 tonnes, form the second tier of the cryostat lower cylinder. Manufactured by Larsen & Toubro in India, they will be assembled and welded in the on-site Cryostat Workshop at ITER. 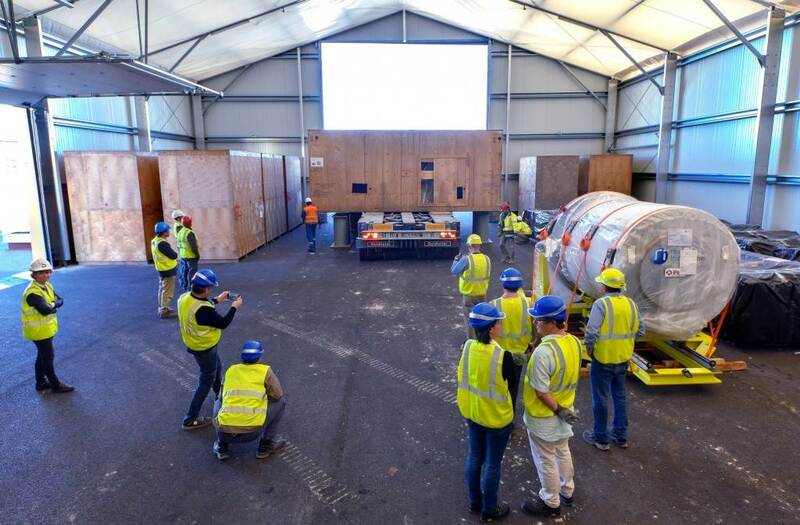 The crate arriving in this ITER storage facility contains part of the central solenoid assembly platform. 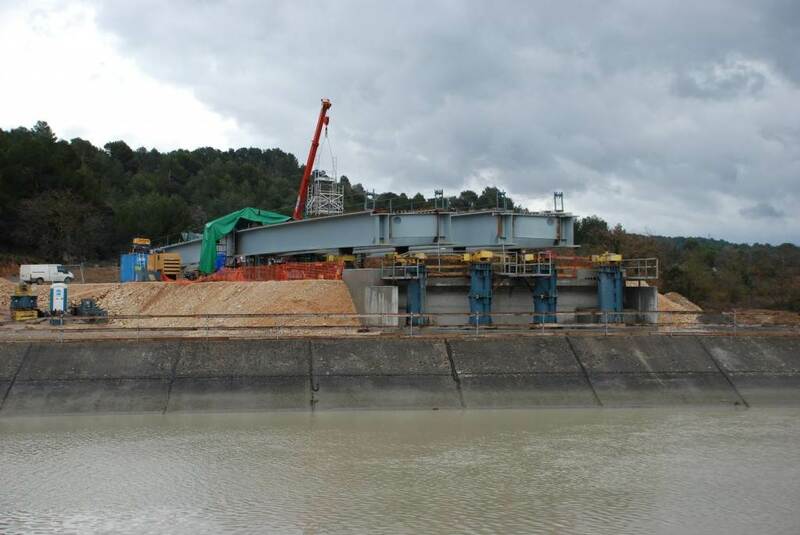 Designed to support the 1,000-tonne final central solenoid with a security margin of 300 tonnes, the platform (procured by the US) will be installed in the ITER Assembly Hall. Four converter-transformers from China were delivered on Wednesday, 27 September. They will soon take their place outside of the Magnet Power Conversion buildings. 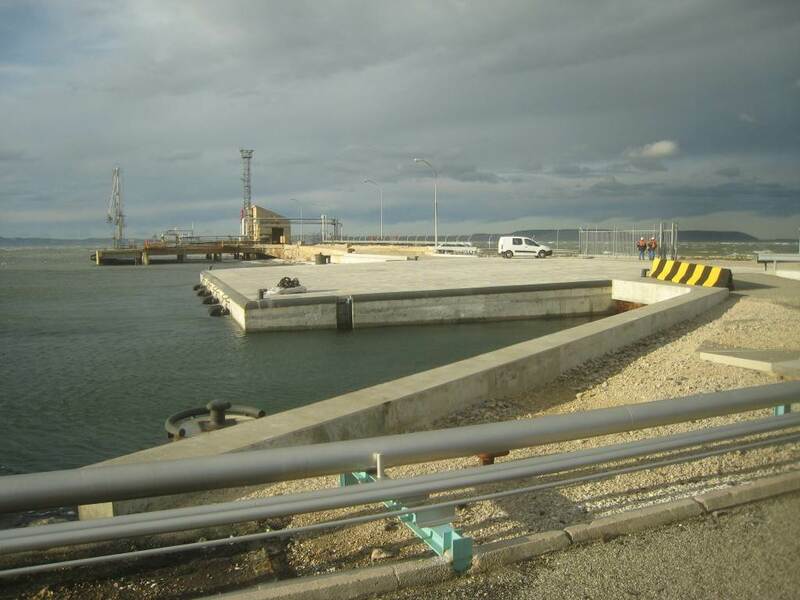 A new roll on/roll off ramp has been built at the Mediterranean port of Fos-sur-Mer. 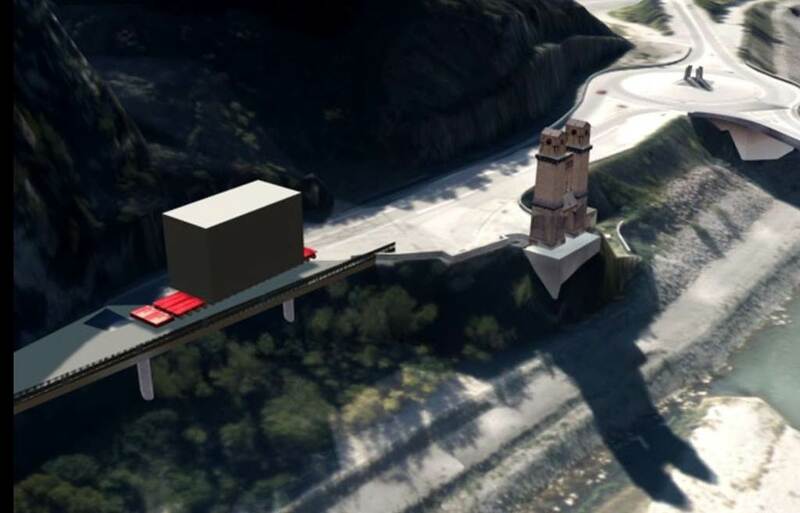 It has been designed to facilitate the transhipment of ITER components, but is also available to other users. These DC aluminium busbars, fabricated by the Efremov Institute in Saint Petersburg, Russia, are part of the most recent shipment of electrotechnical equipment that has been dispatched by the Russian Domestic Agency. 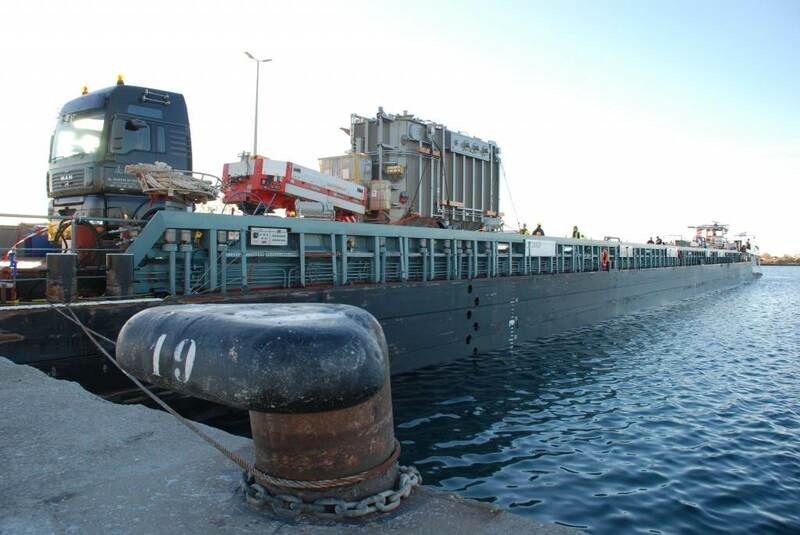 Eighty-five tonnes of busbars, plus other components, are on their way. This insulated cryoline from India has been unloaded and stored temporarily on site. Europe is equipping the Poloidal Field Coils Winding Facility with a new heavy-lift gantry crane. 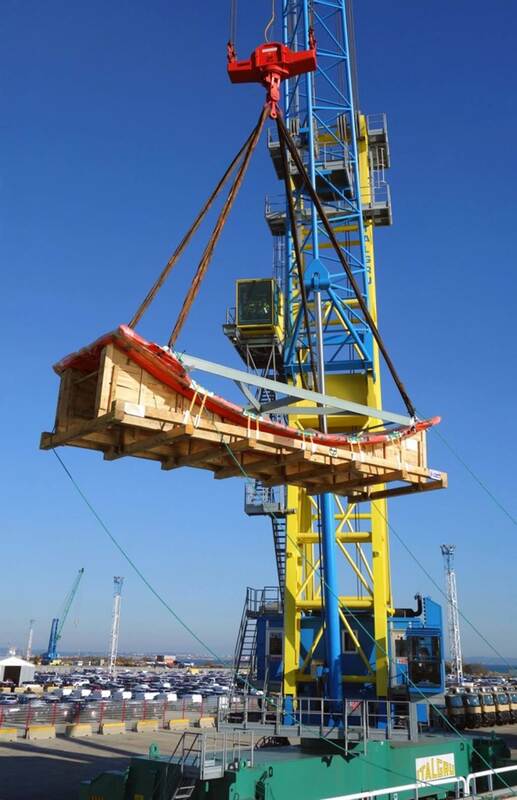 Three of four crane beams arrive on site on 25 July. The toroidal field coil cases are massive structures in steel that will house the D-shaped 110-tonne superconducting winding packs. Japan is responsible for 19 complete coil case sets (including one spare). 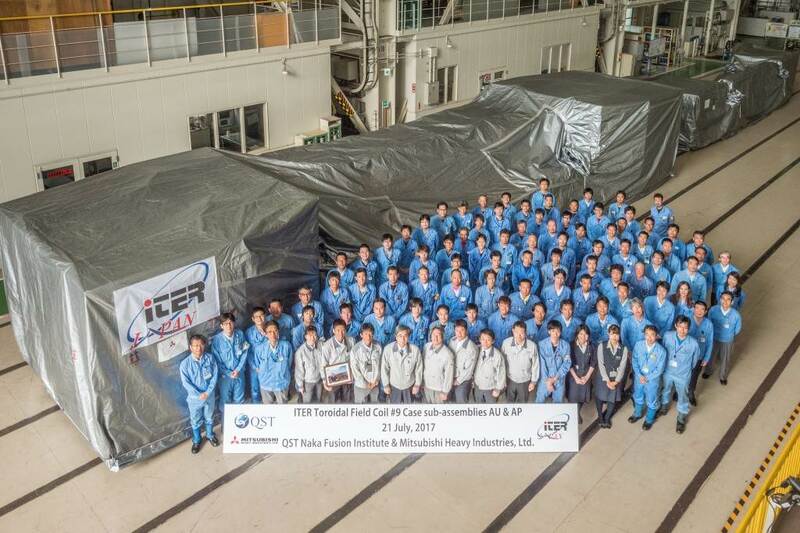 The first completed case segment left Mitsubishi Heavy Industries in Japan late July (photo) for shipment to Korea, where part of the coil case fabrication is taking place. 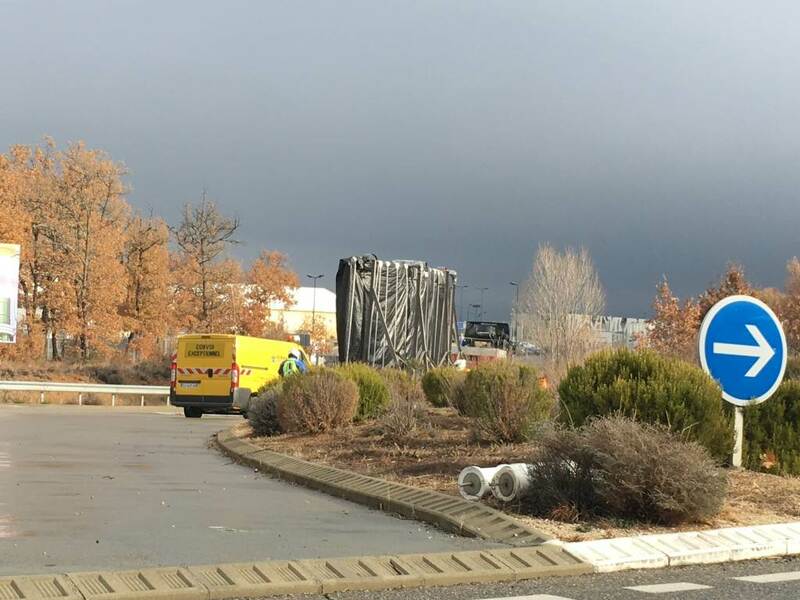 Not far from the Assembly Hall where the tool will be installed, segments of the first SSAT tool (for vacuum vessel Sector Sub-Assembly Tool) are stored under protective tarpaulin. At ITER, two massive sector sub-assembly tools will suspend and equip the vacuum vessel sectors in the Assembly Hall before their installation in the Tokamak Pit. 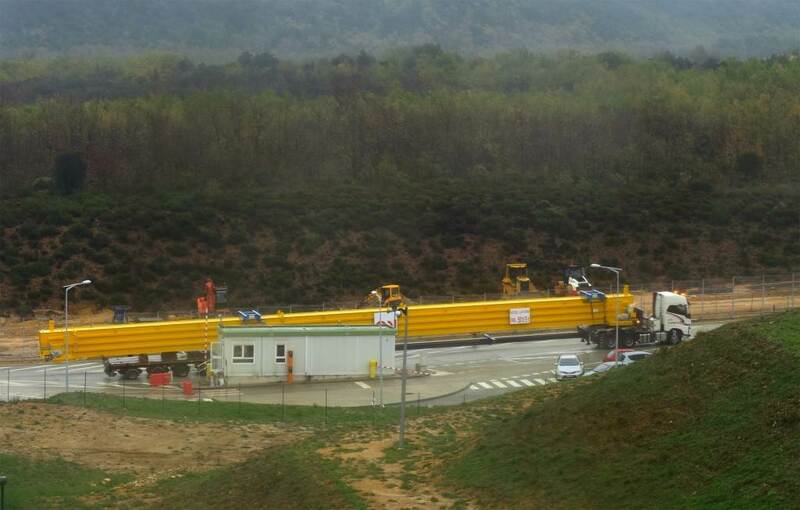 Following fabrication, assembly and testing in Korea, the first of the giant tools (22 m tall, 800 tonnes) is on its way to ITER in batches. 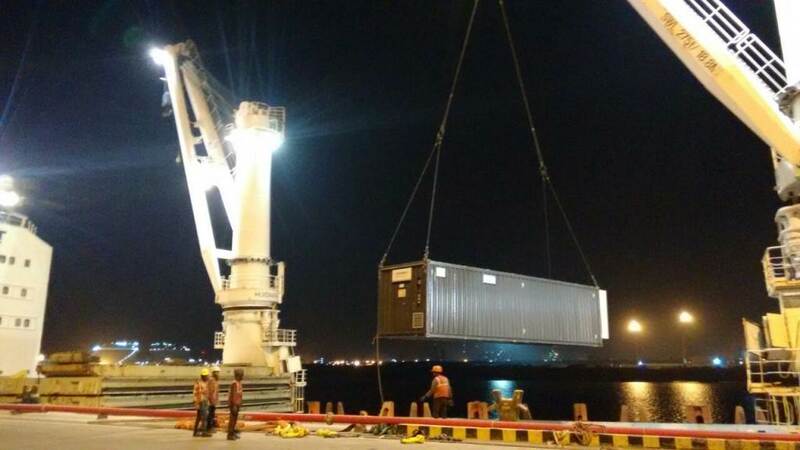 The first crates reached the site on 22 June. 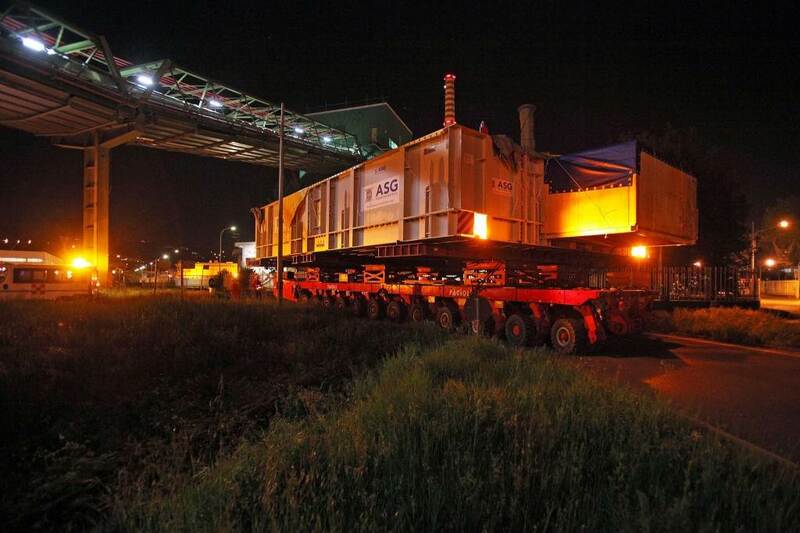 An AC/DC transformer travels at night on 20 June to reach the ITER site. 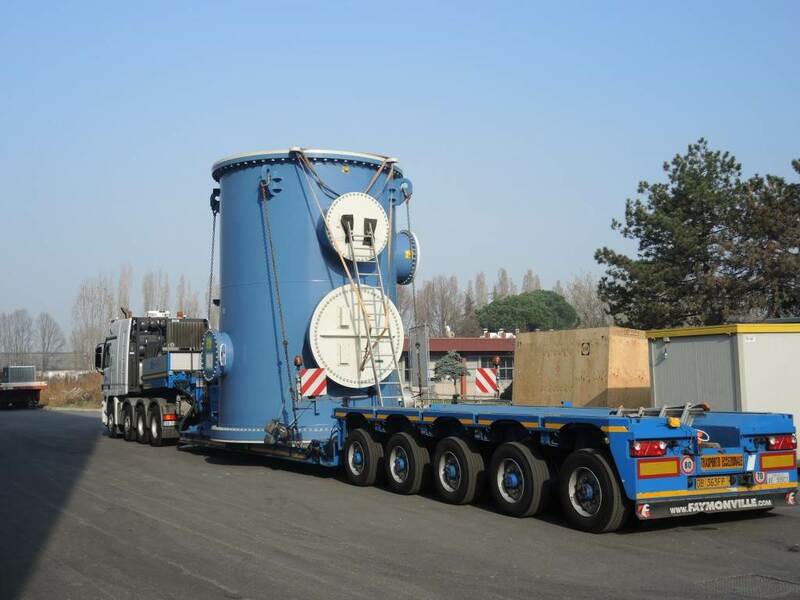 It was shipped by China for ITER's poloidal field coil electrical transformation system. 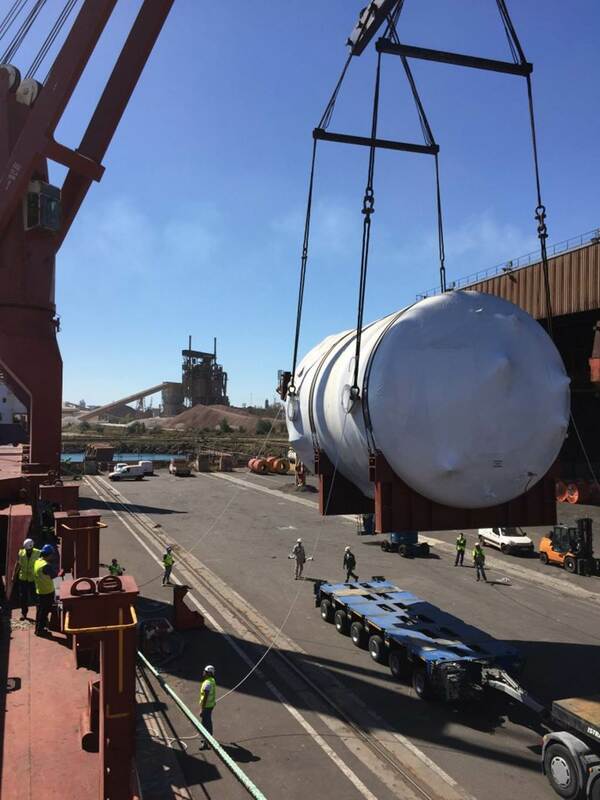 Delivered to temporary storage on 1 June, these three tanks for gaseous helium will be installed at a later date near the cryoplant in a large exterior zone reserved for the storage of helium and nitrogen in liquid and gaseous forms. 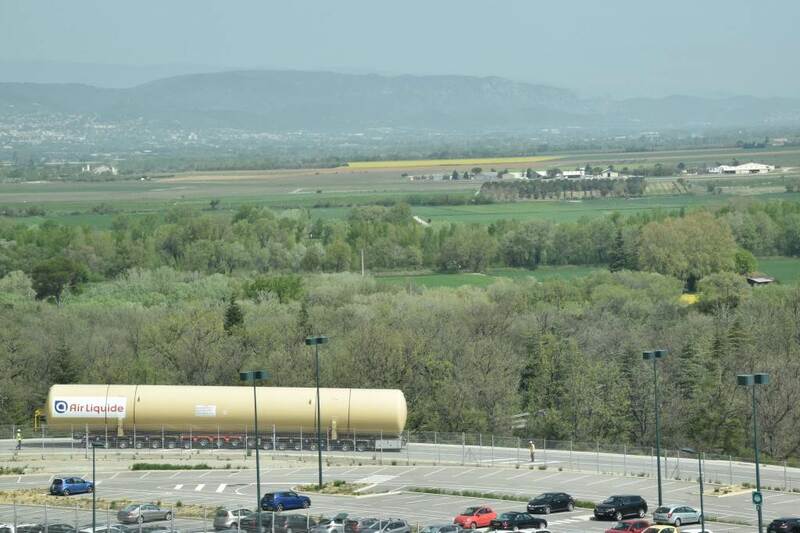 Three storage tanks for gaseous helium are on their way to ITER, shipped by the European Member as part of its contributions to the ITER cryoplant. 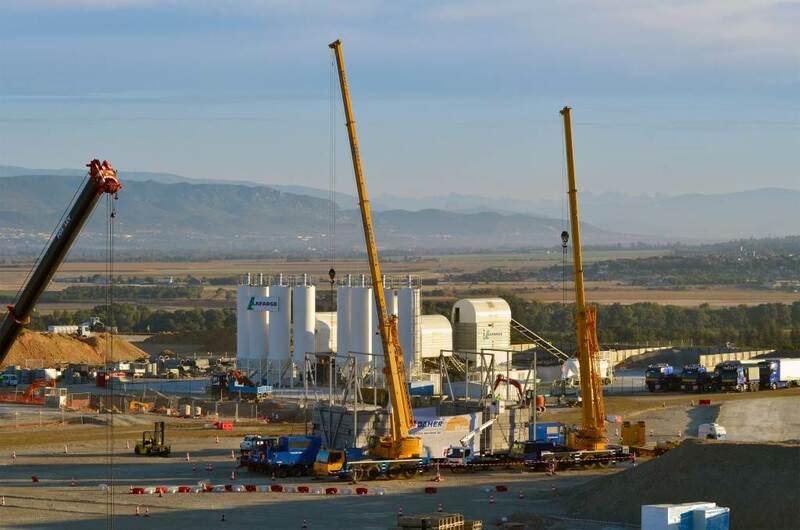 The distribution of cryogenic power at ITER will require approximately five kilometres of cryolines. The first batch has just left India, which is responsible for procuring the cryolines, the warm lines and cryodistribution components. 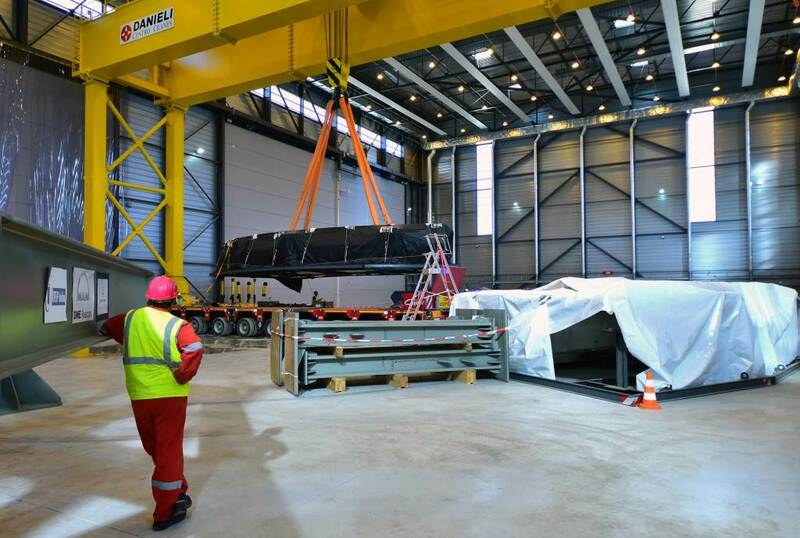 Following successful factory acceptance tests, ITER's largest assembly tool has been dismantled and packed for shipment. 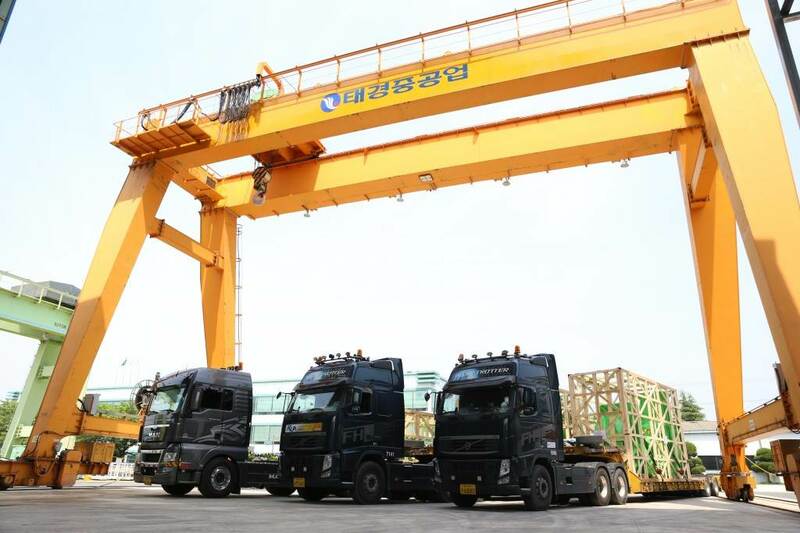 The first batch of components is already travelling between Ulsan, Korea and Fos-sur-Mer, France and is expected on site late June. 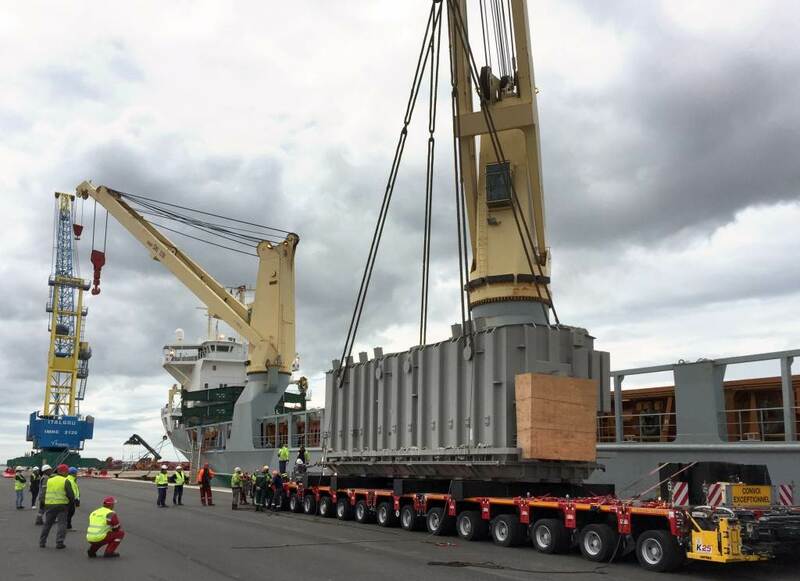 Electrical transformers weighing a combined 550 tonnes have arrived on site from China. They will be installed in their permanent positions in May. 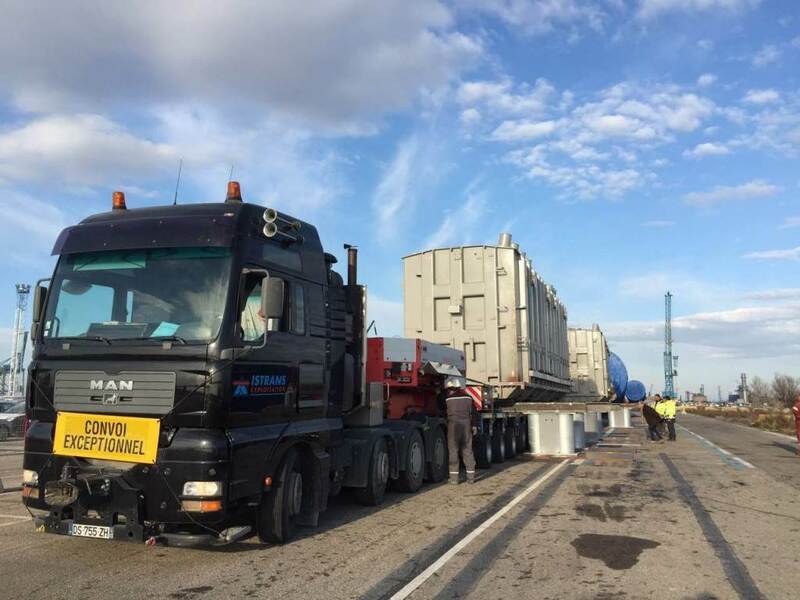 A three-trailer convoy arrives at the ITER site early on 13 April carrying two electrical transformers from China and a helium storage tank delivered by Europe. 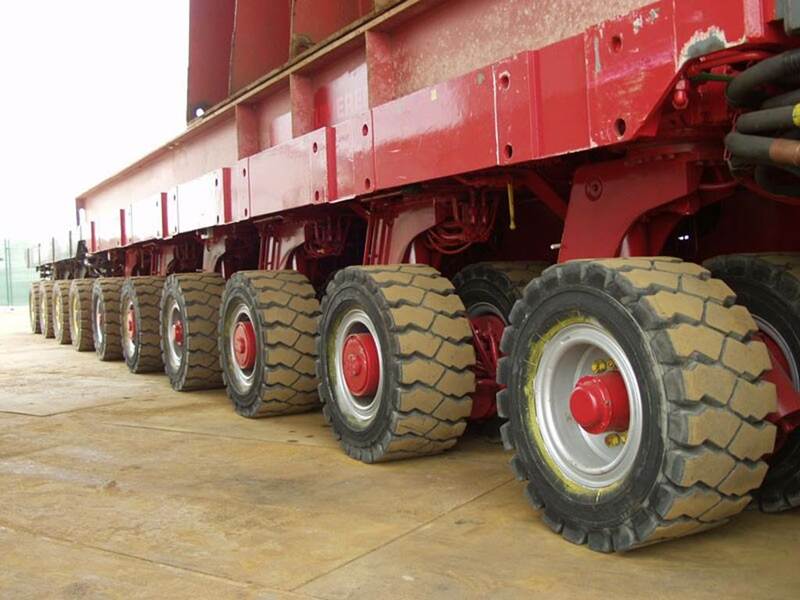 The combined weight of the three components is 700 tonnes. 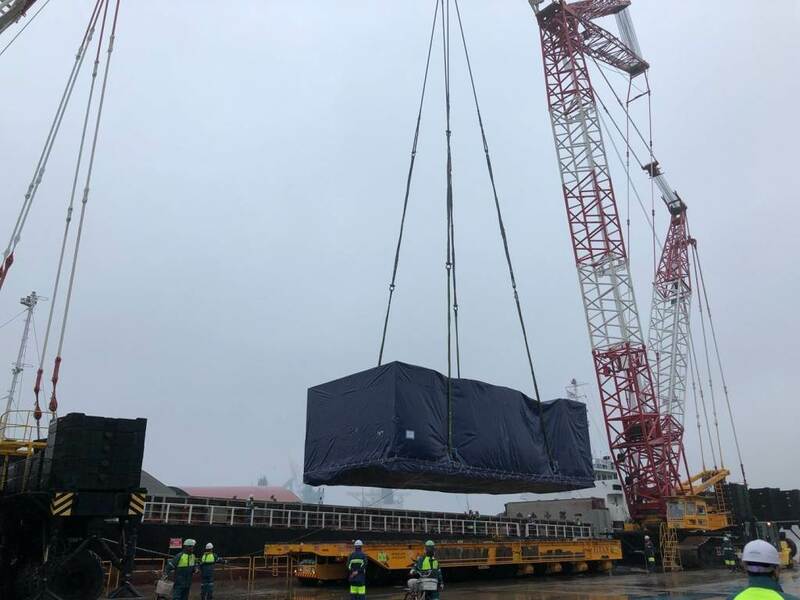 Japan is supplying all the high voltage power supplies for MITICA, the full-scale ITER heating neutral beam under installation at the PRIMA neutral beam test facility in Italy. The DC filters delivered in March 2017 are the output sections of the five high voltage generators from -200 kV to -1MV, feeding the accelerator. They are contained in a big tank that will be assembled during the installation phase; later the tank will be filled with SF6 insulating gas at 6Bar. 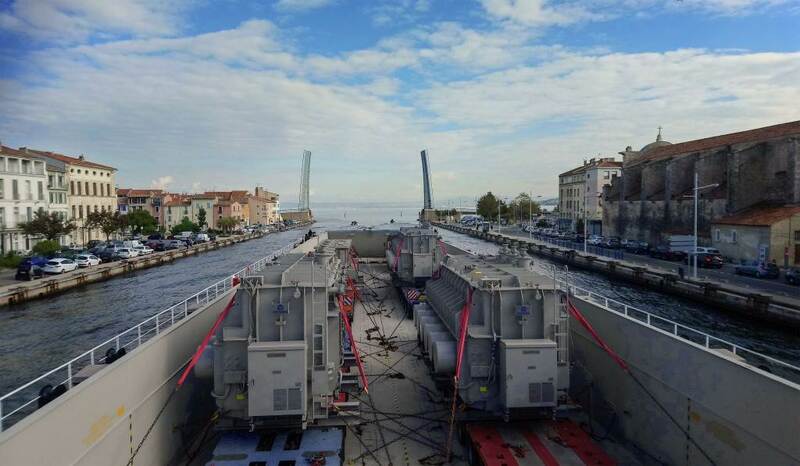 Four segments of the ITER cryostat await transport on the pier in Fos-sur Mer, after arriving from India. They will be deliver one at a time to the ITER site. 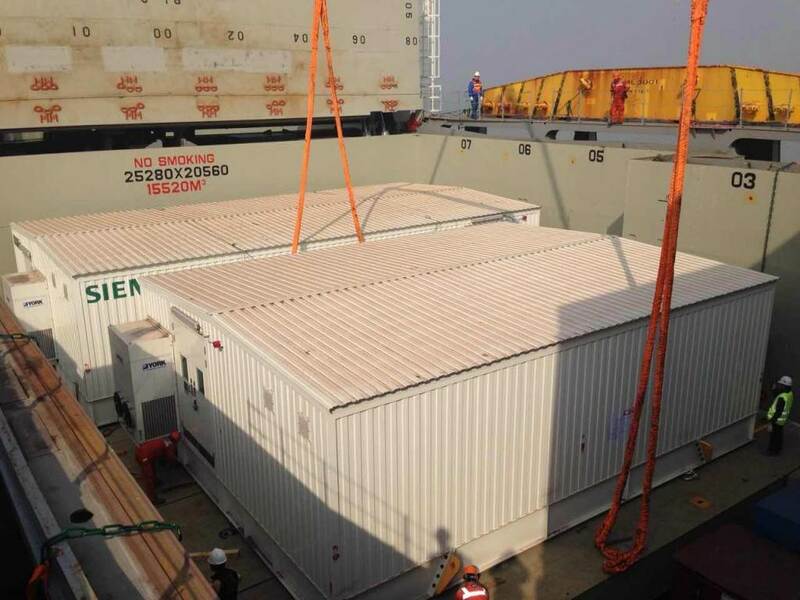 Shipped from China, two components for the electrical switchyard reached ITER in early February: 8-metre-wide "E-houses." 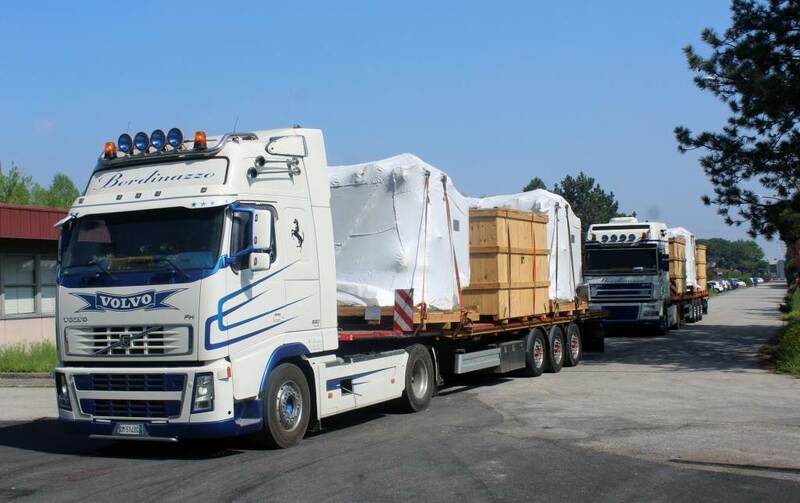 Two 300-tonne electrical transformers procured by China have reached France are in storage until their transfer to the ITER site along the 104-kilometre ITER Itinerary in March. 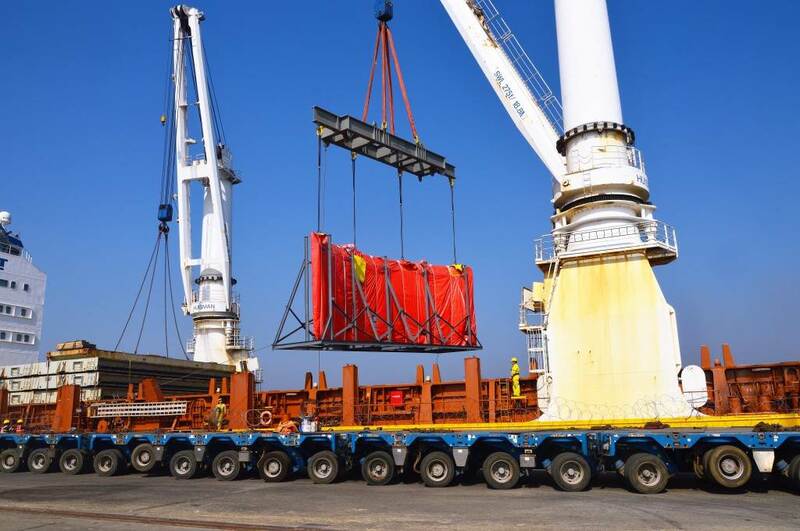 Late January, six large steel elements of the ITER cryostat left the port of Hazira, India for their voyage to ITER. They represent the first tier of the cryostat lower cylinder. 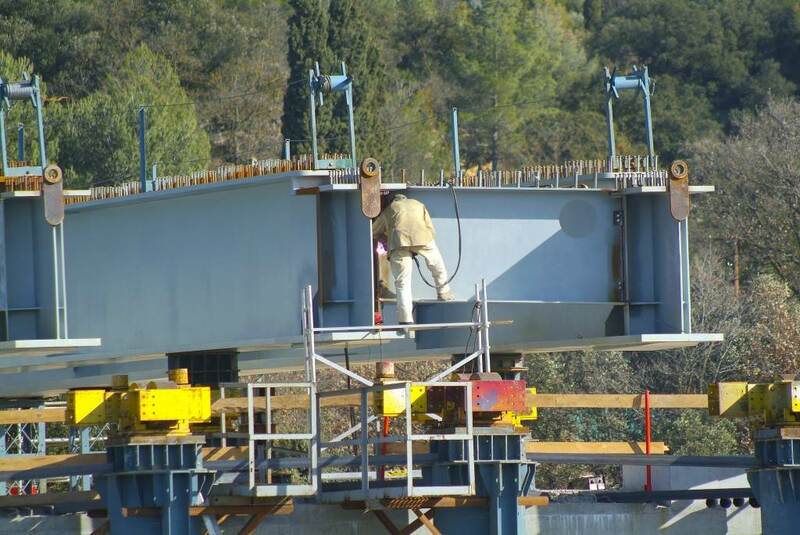 On site at ITER, assembly activities (welding, testing) for the base of the cryostat have been underway since September 2016. 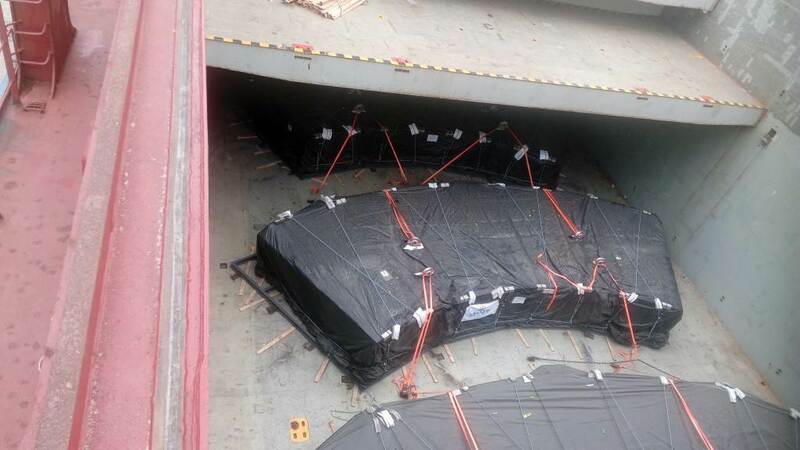 Four containers—part of the "ozonator package" and containing ozone generators—left Hazira, India for ITER on 27 January 2017. Ozone will be used in the heat rejection system at ITER to limit the growth of bacteria. 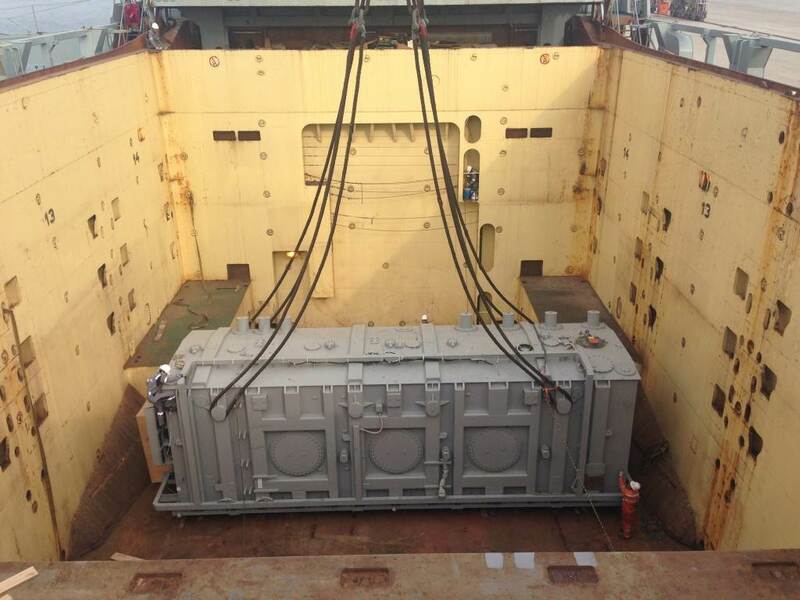 On 29 November, two 300-tonne transformers for ITER's pulsed power electrical network (PPEN) were loaded aboard ship in Shanghai, China. 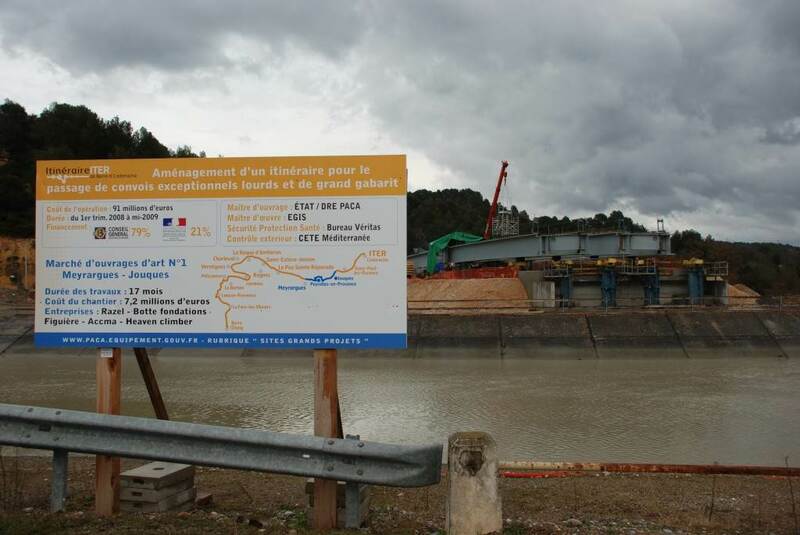 They are expected to reach the Mediterranean port Fos-sur-Mer in January and the ITER site early February. 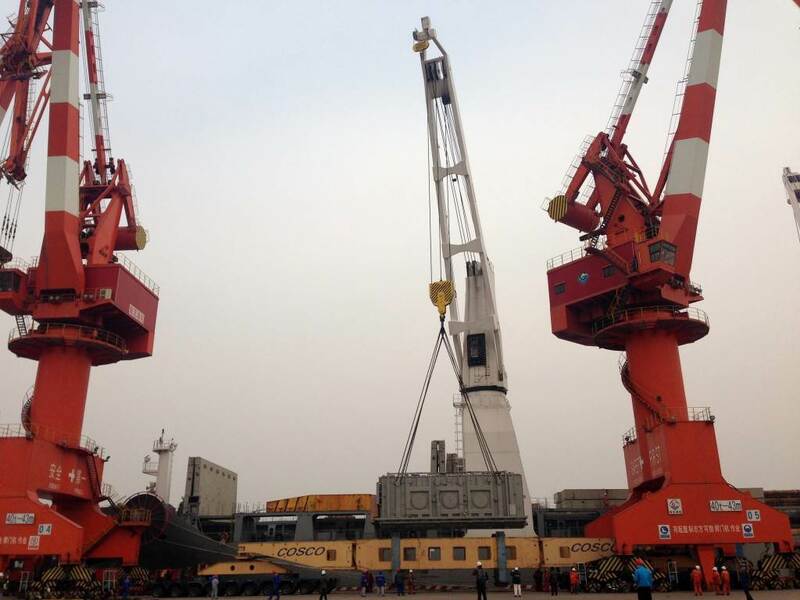 Accompanying the PPEN transformers on the boat from China are two E-houses, which are packed with I&C cubicles to relay orders from ITER's control room to the high voltage components of the 400 kV and 66 kV switchyards. 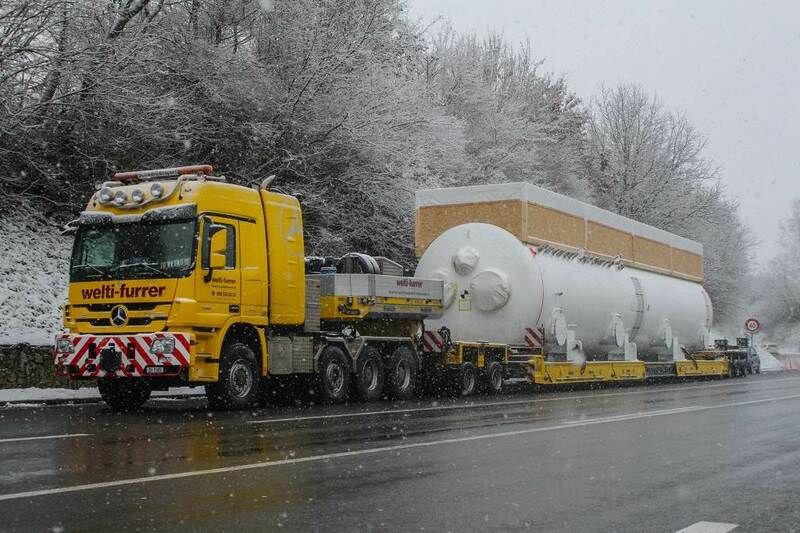 Two 35-metre quench tanks, part of Europe's contribution to the ITER cryoplant, arrive on site on 24 November. 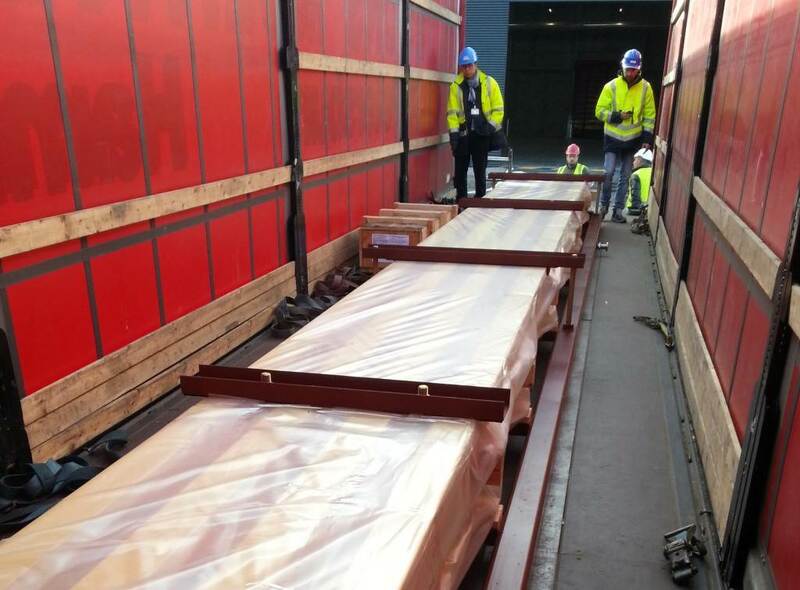 Girders for the 50-tonne auxiliary cranes of the Assembly Hall are delivered on 8 November. 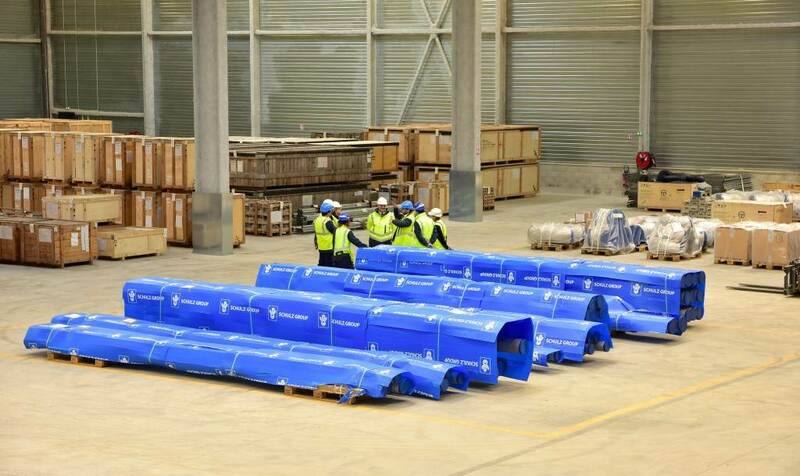 In November, cooling water pipes are delivered for storage to a 9,000 m² warehouse located on site. 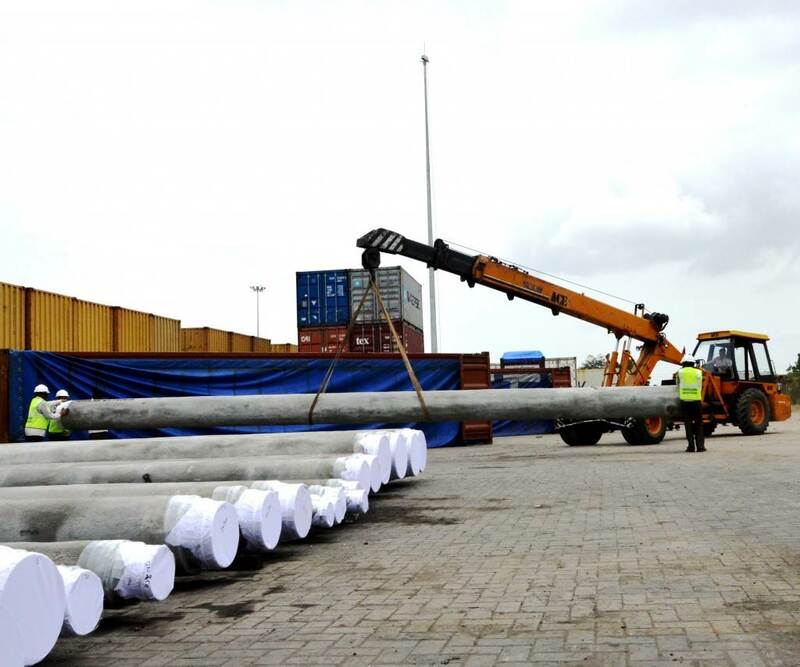 This is the first shipment of "centralized" piping—that is piping for different cooling water systems procured from the same supplier for cost efficiency. Salt water can corrode metal parts. 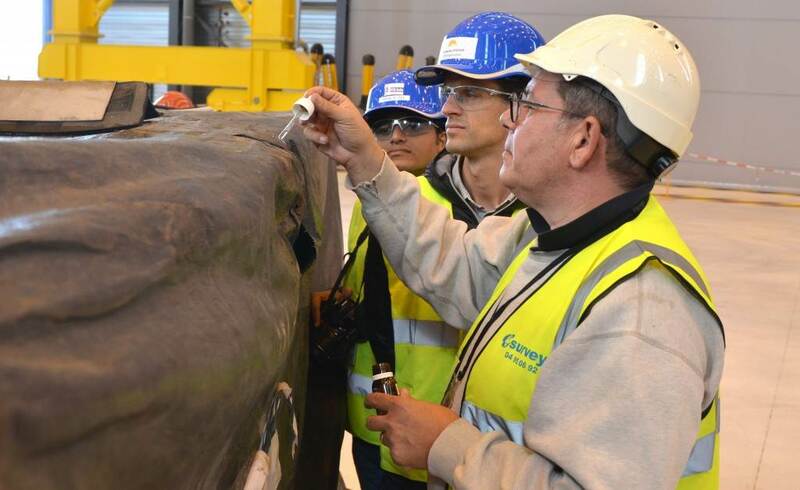 In order to test whether salt water has accumulated on the protective covering of the cryostat segments recently delivered to ITER, technicians use an eyedropper and a few drops of diluted silver nitrate. If salinity is found, the tarpaulins are rinsed off before being removed. After a 9,000-km sea voyage, transport by barge, and finally a 104-km road trip along the ITER Itinerary, the last pieces of the cryostat base are unloaded in the on-site Cryostat Workshop on 20 October. 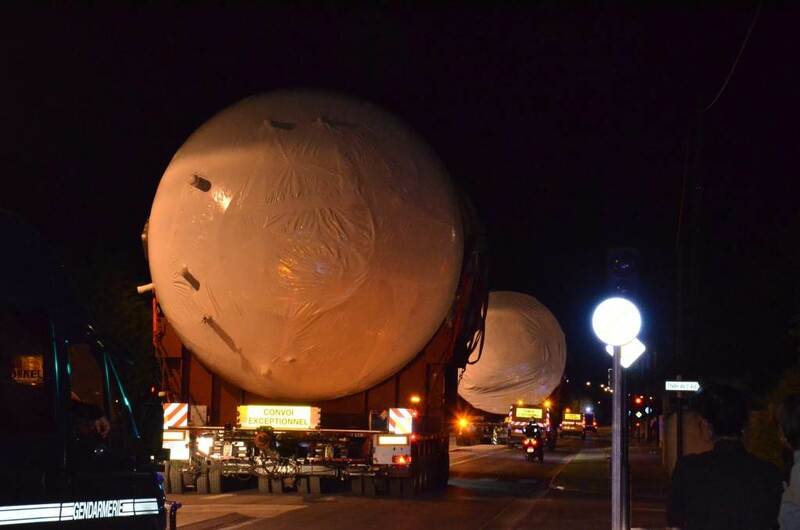 Two 35-metre tanks have left their production site in the Czeck Republic and are currently en route for ITER. 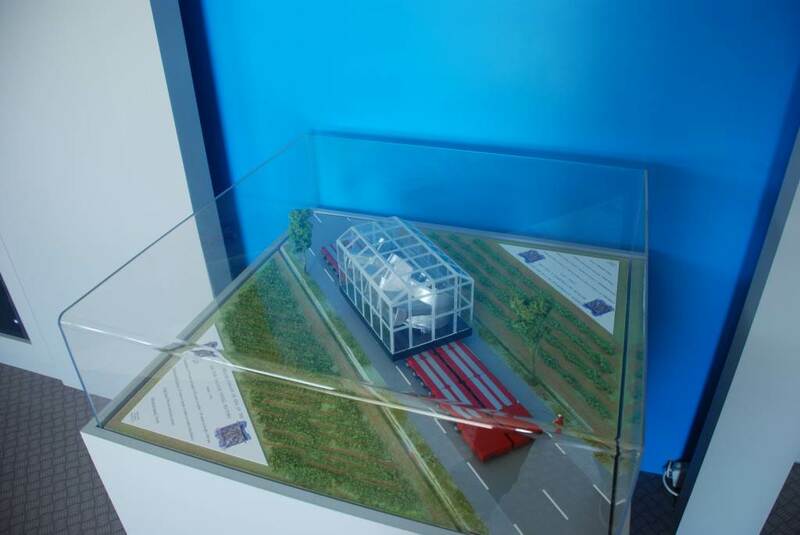 Produced for the European contractor Air Liquide, they are destined for ITER's cryoplant. 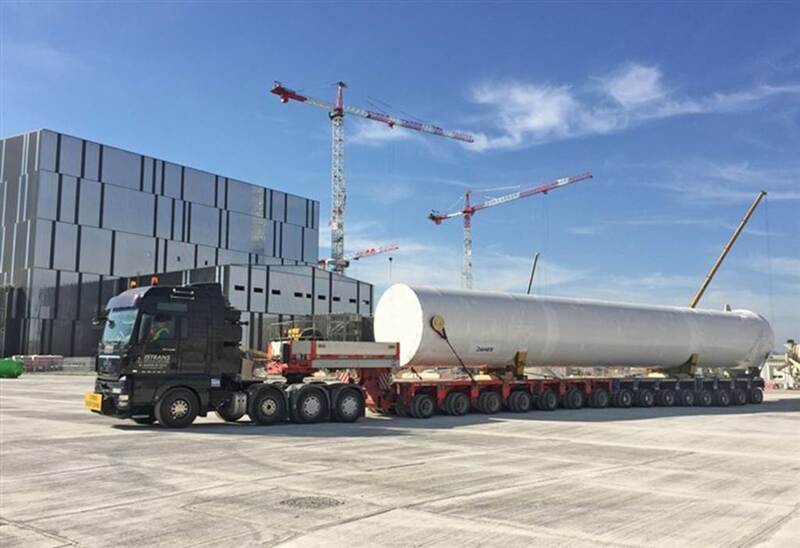 Three 120-tonne tier-2 cryostat base segments have been unloaded in Fos-sur-Mer, France, for transport to the ITER site. 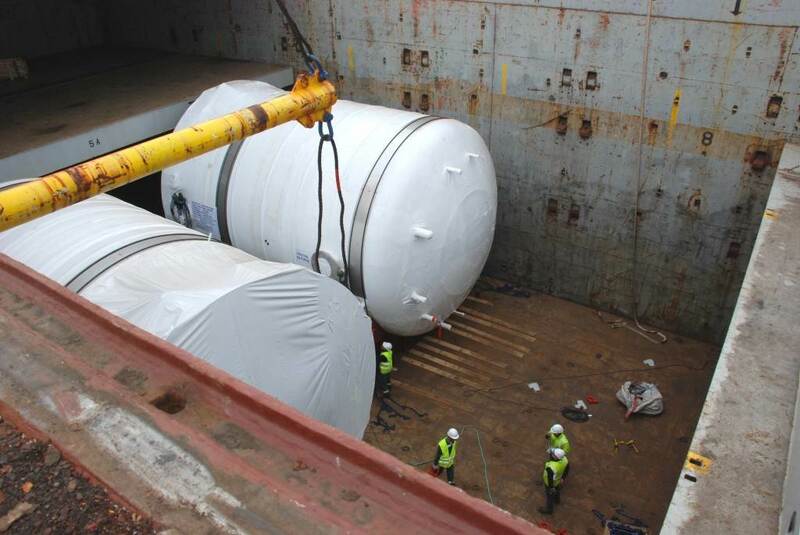 Shipped from India, these segments are the last major components required for the on-site assembly of the 1,250-tonne cryostat base. 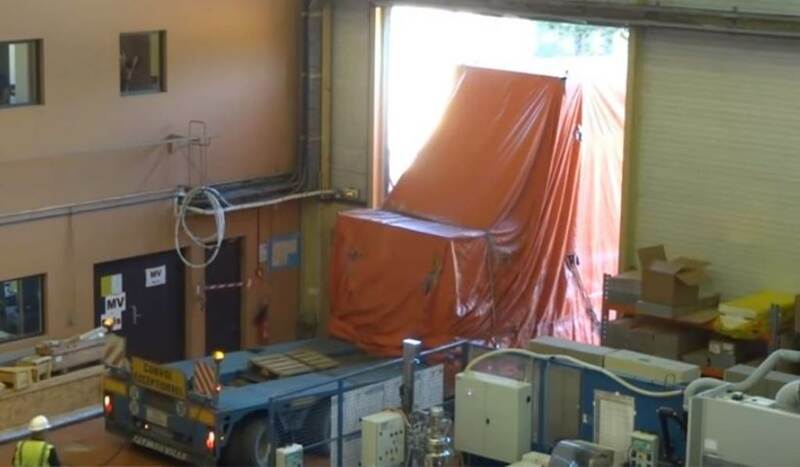 Two of three liquid helium "cold boxes" are packed for transport to ITER. These vacuum vessels are part of the ITER cryoplant, housing key components for the process of cooling helium. 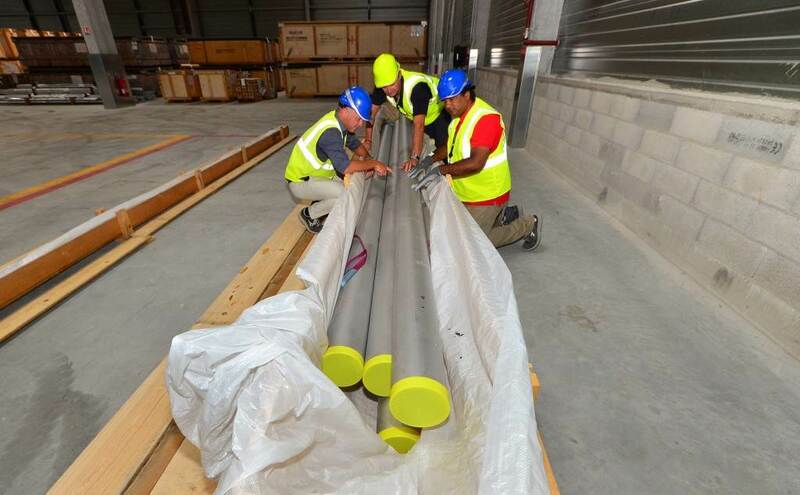 The first batch of seamless stainless steel piping for ITER's vacuum system is received in September 2016 for testing. Ten kilometres of pipes like these will connect vacuum pumps to the cryostat, vacuum vessel and neutral beam injector. 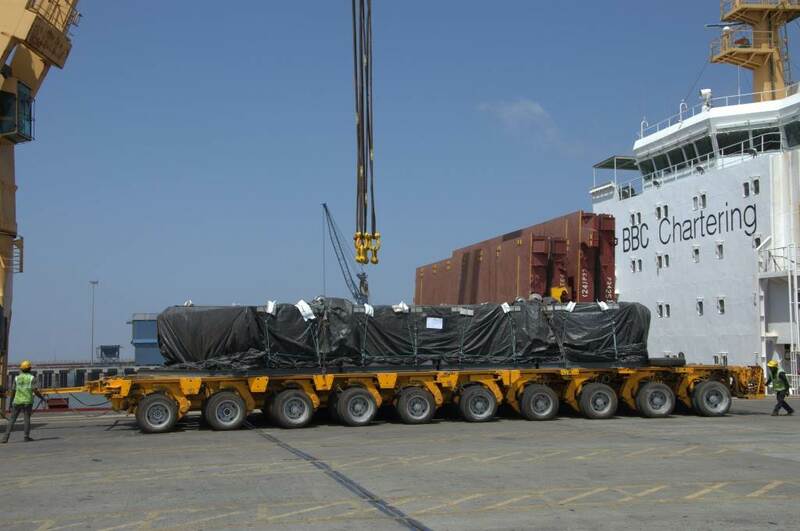 On 7 September 2016, India ships a new batch of piping to the ITER site. 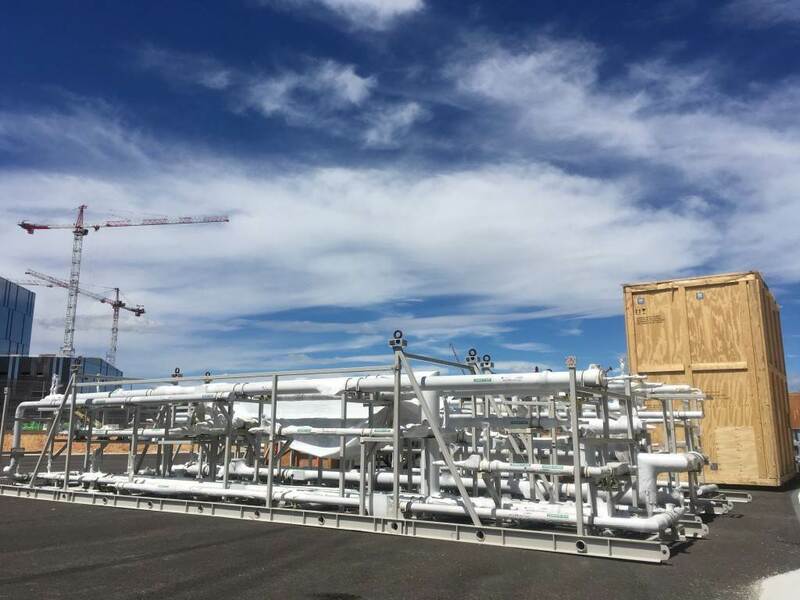 The piping is destined for the buried networks of the heat rejection, chilled water and component cooling water networks of the ITER installation. 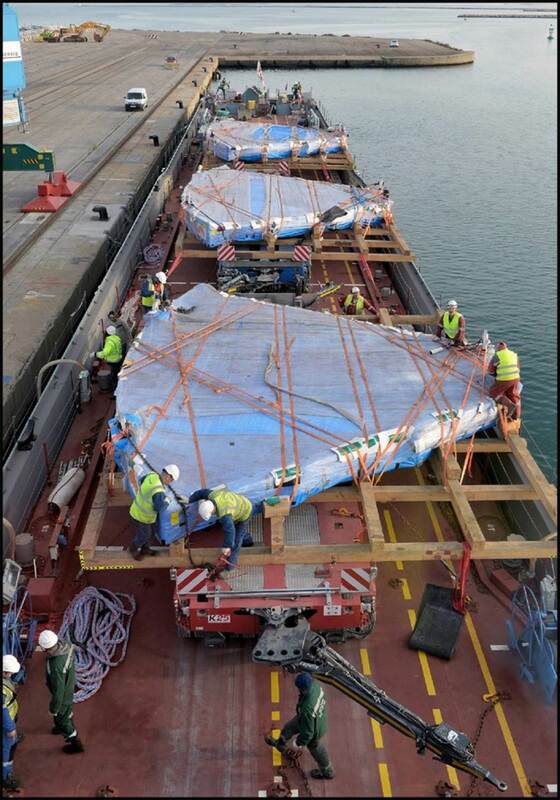 The last shipment of cryostat base segments (three segments/120 tonnes each) leaves Hazira, India in early September. 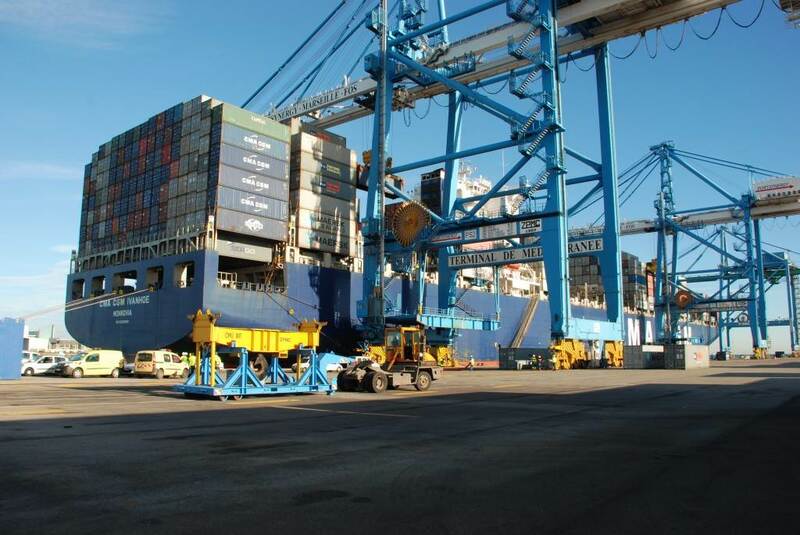 The voyage to the port of Fos-sur-Mer, in France, will take approximately one month. 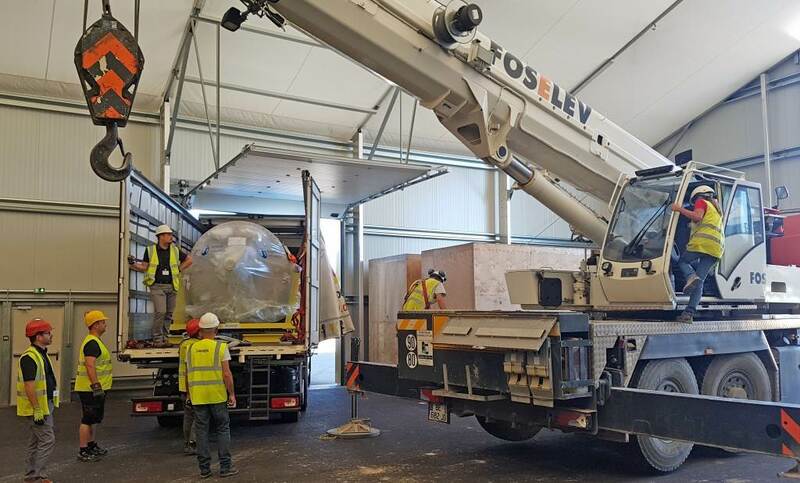 Three large 60° segments of the ITER cryostat base (tier 2) reached Fos-sur-Mer in mid-June and are expected in a three-trailer convoy soon at ITER. 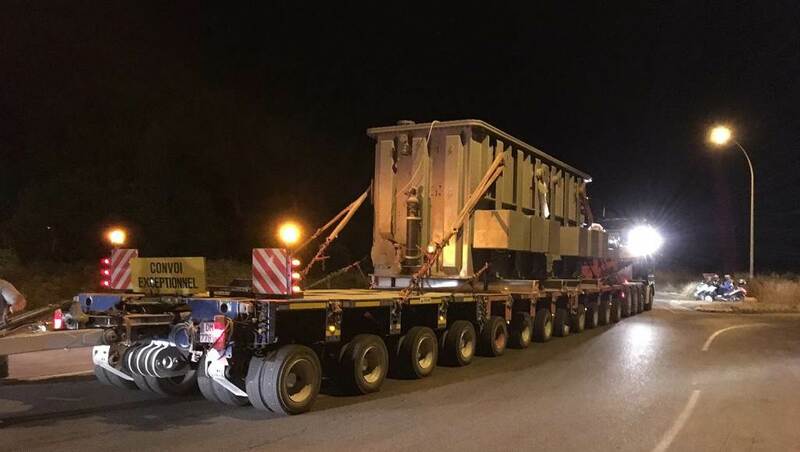 A Highly Exceptional Load convoy carrying a 300-tonne electrical transformer procured by China reached the ITER site in the early hours of 6 June. 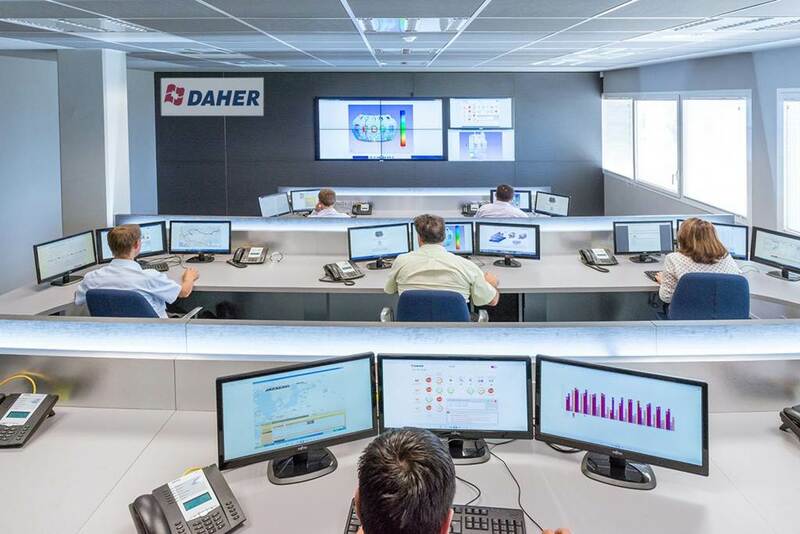 Near the Marseille-Provence airport, ITER's Global Logistics Provider DAHER operates a control room that tracks the movements of every component shipped by the Domestic Agencies to the ITER site. 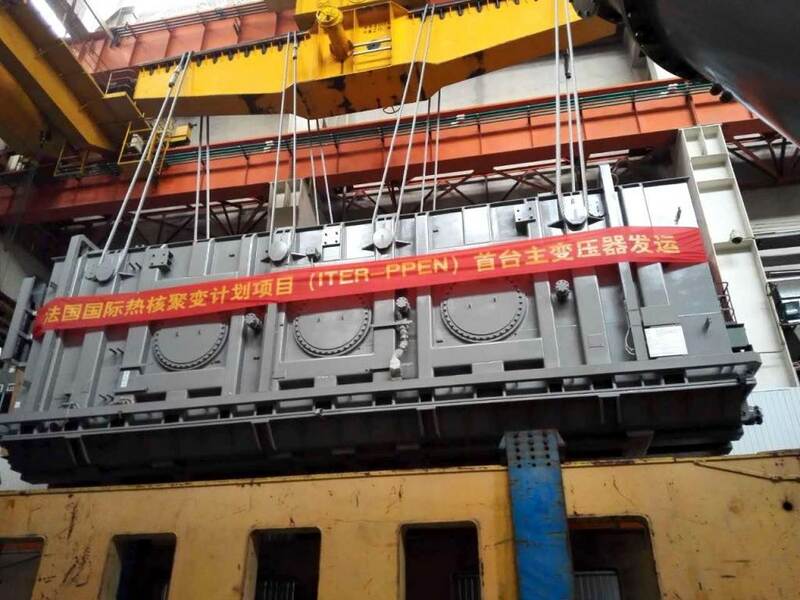 China will be supplying three giant electrical transformers for ITER's pulsed power electrical network (PPEN). 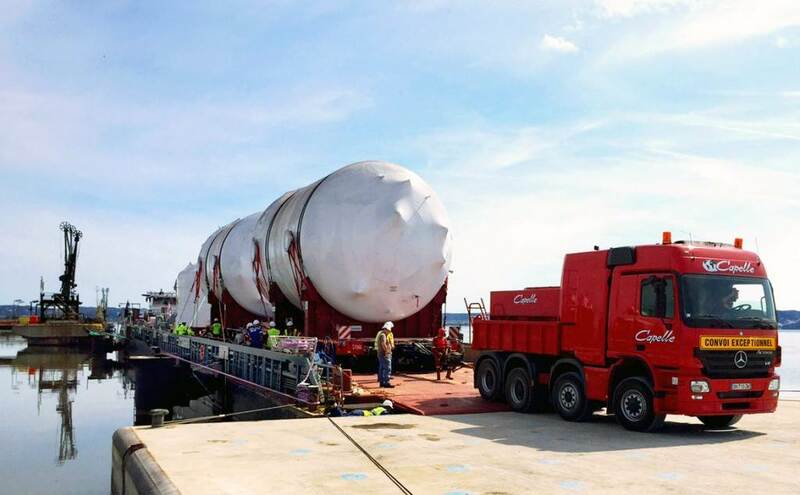 The first was unloaded in Fos, France on 1 June (picture) for delivery as a Highly Exceptional Load along the ITER Itinerary. 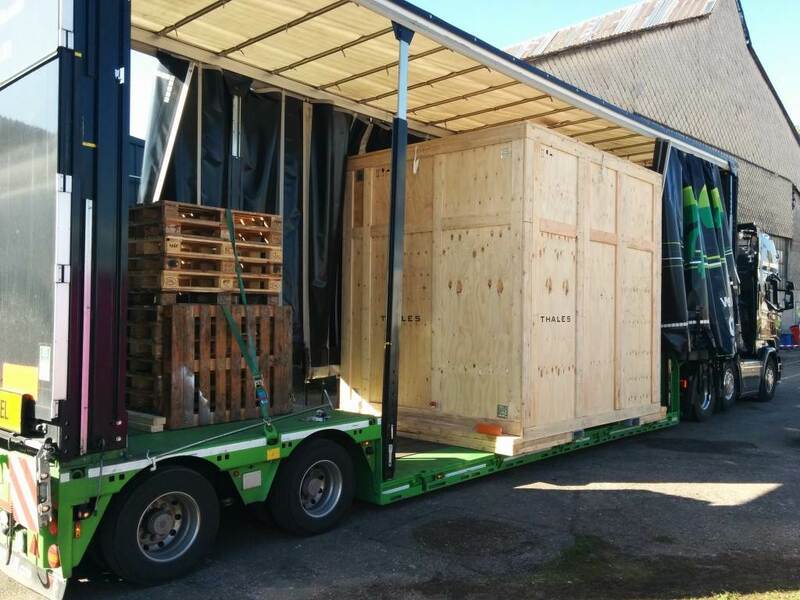 In late May, three segments of the ITER cryostat were loaded in India for travel to France. Also in the ship's hold—elements of the cryostat transportation frame. This frame—which will be re-assembled on site—will support the components, jigs and fixtures during the assembly process. 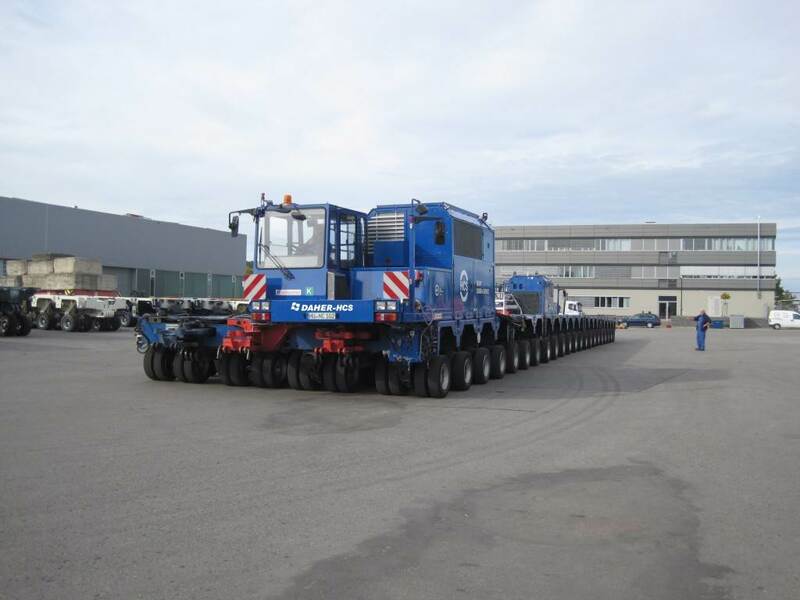 A double convoy on 21 April prepares to transport the second pair of Assembly Hall crane girders along the final leg of the ITER Itinerary to the ITER site. 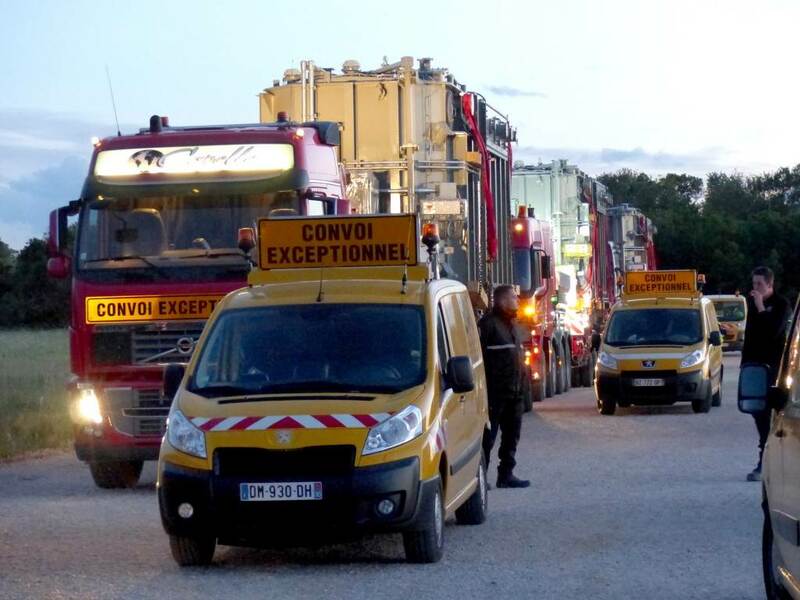 The 250-metre convoy is one of the longest to ever travel the roads of southern France. 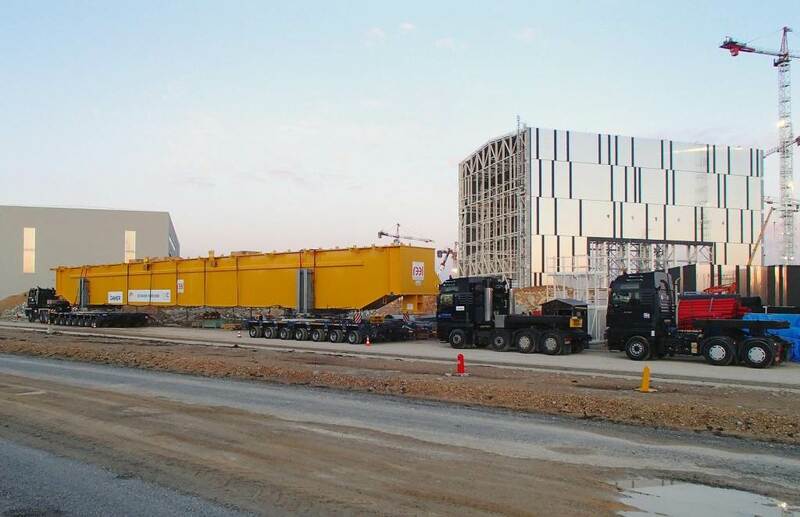 This 278-tonne transformer for ITER's pulsed power electrical network (PPEN) left the Chinese port of Tianjin on 17 April and is expected to reach France in early June. 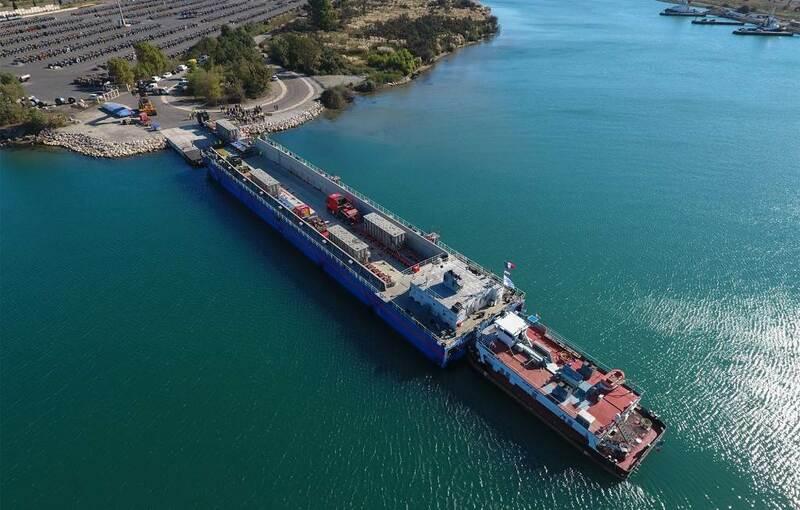 This is the first "Highly Exceptional Load" (HEL) delivered by the Chinese Domestic Agency as part of its in-kind procurement for ITER. 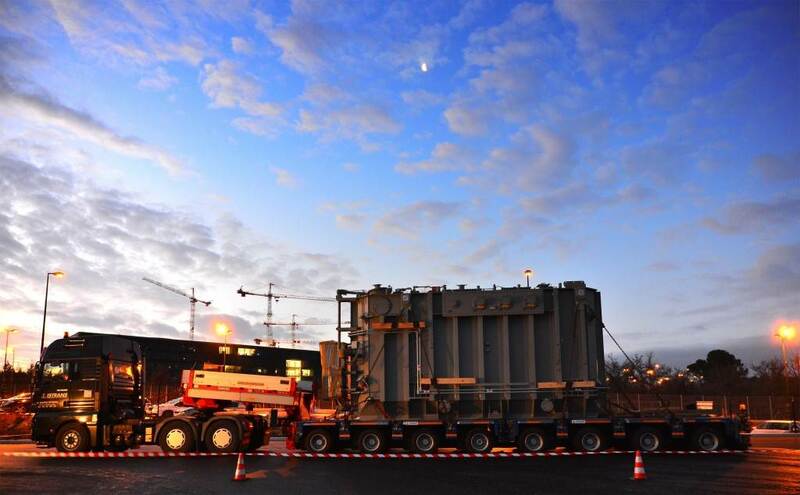 The first of three electrical transformers is en route from China for ITER's pulsed power electrical network (PPEN). These giant components will be installed on the ITER platform to feed power to the heating and control systems during plasma pulses. The SPIDER test bed is a 1:1-scale ion source that will be used to develop the technology for the production of negative ions. 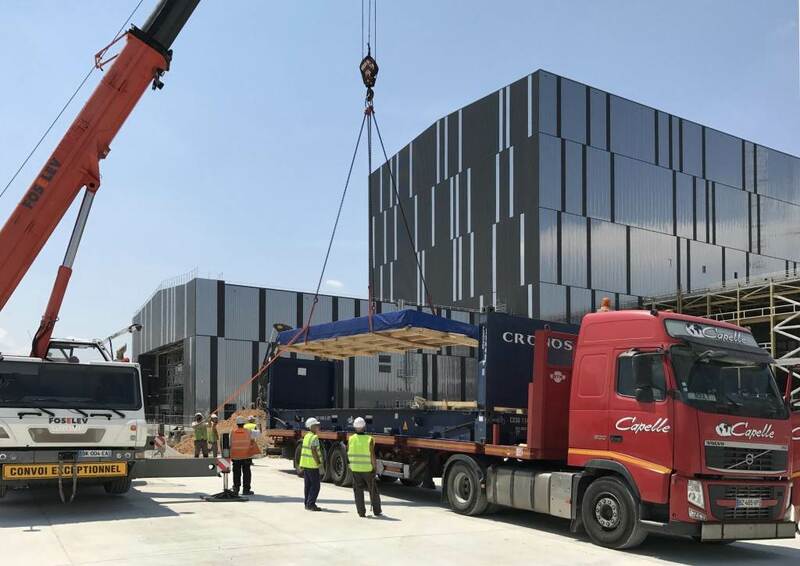 Located at the PRIMA neutral beam test facility in Padua, Italy, components are currently arriving from participating partners Europe, India and Japan. 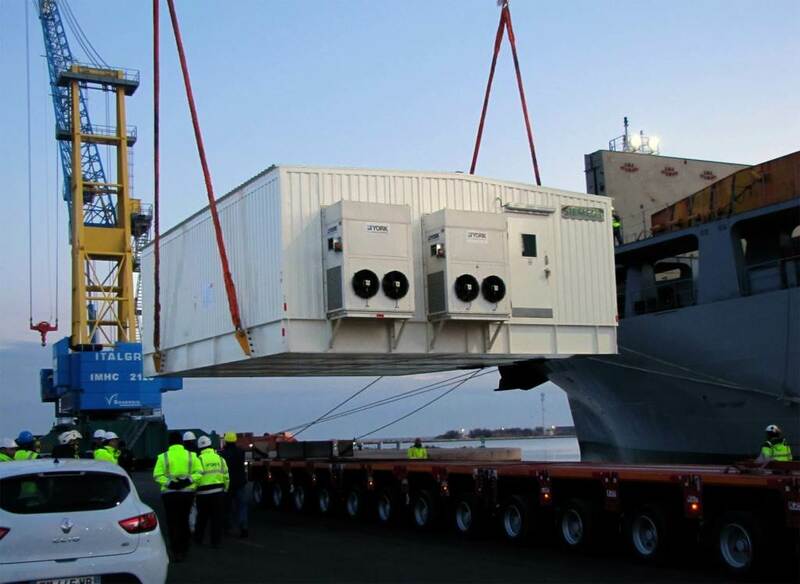 In April, 13 trucks carried transformers, switching modules, controllers, high-voltage racks, cables, and disconnector switches supplied by India for the acceleration grid power supply from their arrival port in Venice to PRIMA. 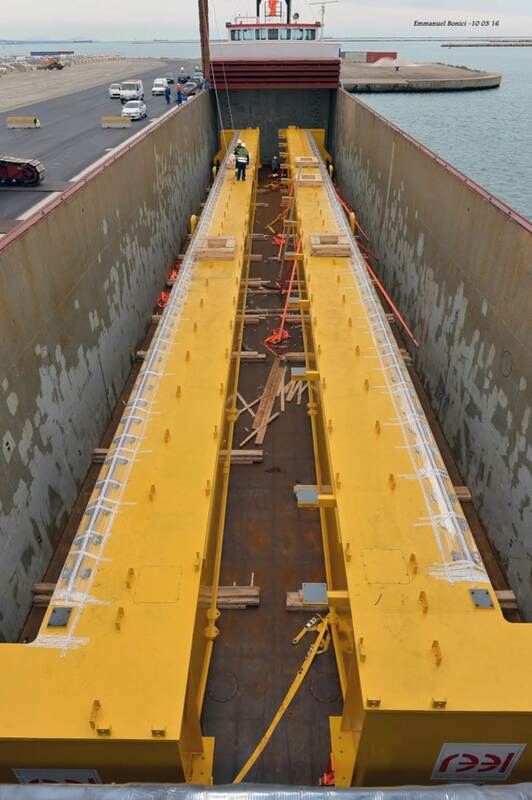 Two 47-metre long girders—destined to cross the width of the ITER Assembly Building in support of the trolley cranes—reach the Mediterranean port of Fos on 8 March. 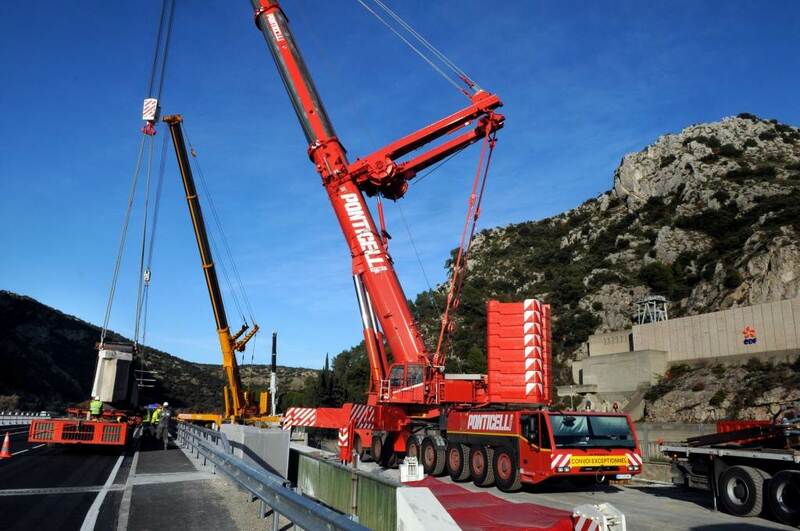 Four girder beams are expected in the next week at ITER, procured by Europe for the heavy lift assembly cranes. 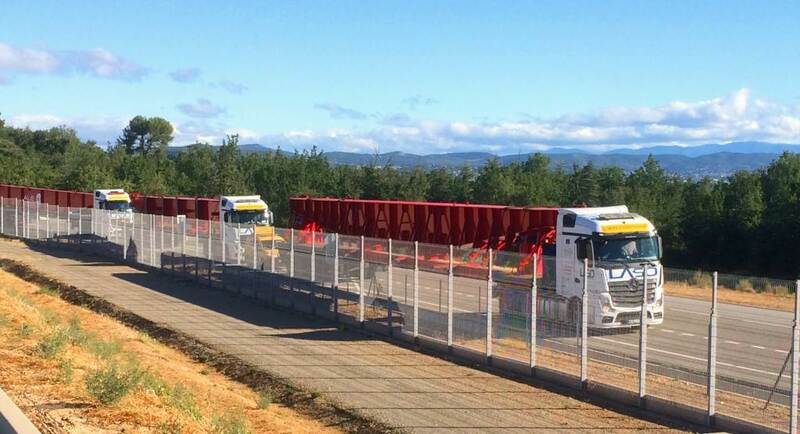 In December, the first lot of Russian-procured busbars reach the ITER site. Over 5 km (500 tonnes) of these components that connect magnet coils to their power sources are expected from Russia under the terms of a Procurement Arrangement signed in 2011. 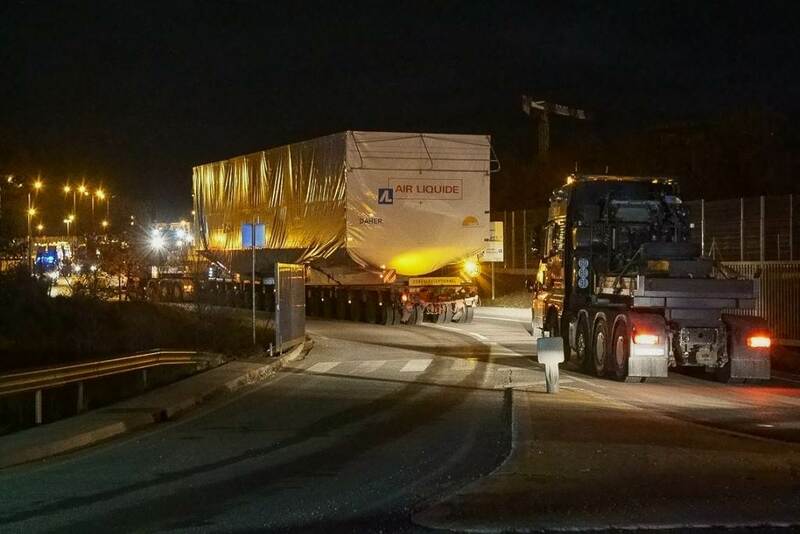 ITER's first machine components are delivered in the early hours of 10 December—three 50-tonne, 60° segments for the cryostat base that were transported by trailer along the ITER Itinerary. In December 2015, Japan delivers its first in-kind contributions to PRIMA, the neutral beam test facility for ITER in Padua, Italy. 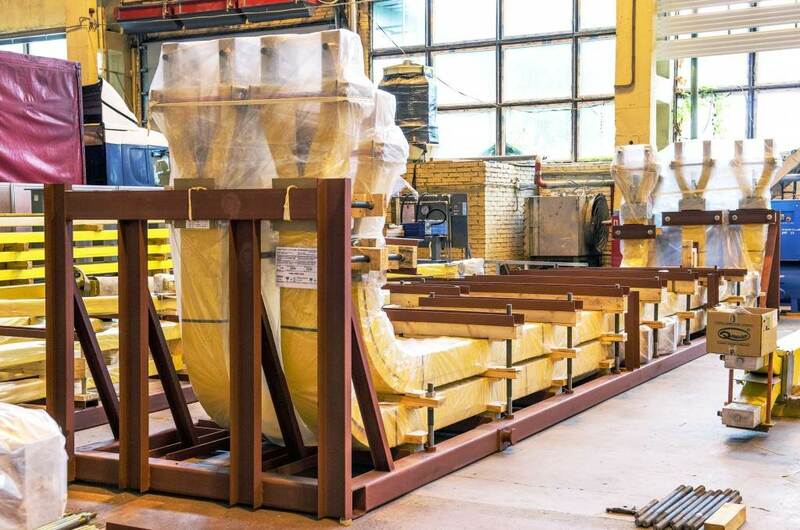 The pressure vessel and the step-up transformer are part of the power supply for the test bed MITICA, which is a full-scale prototype of the 1 MV heating neutral beam for ITER. 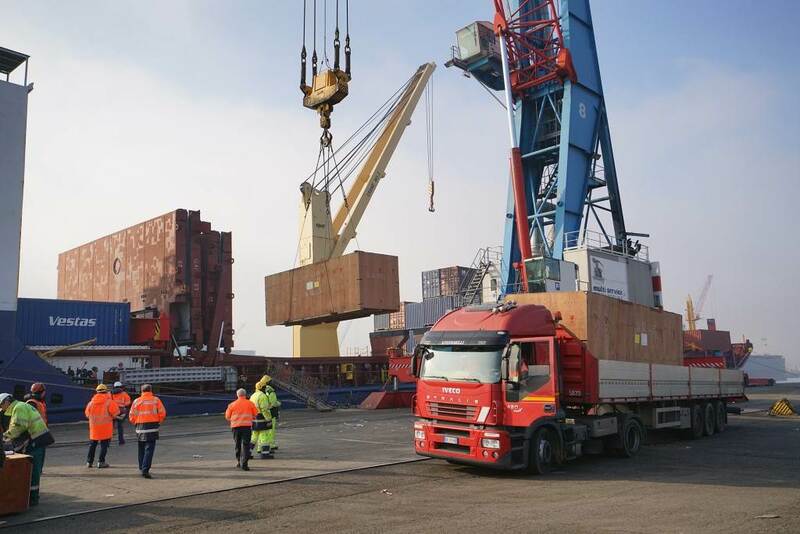 Three weeks after leaving India, 460 tonnes of cryostat components arrive at the French port of Fos-sur-Mer on 24 November. 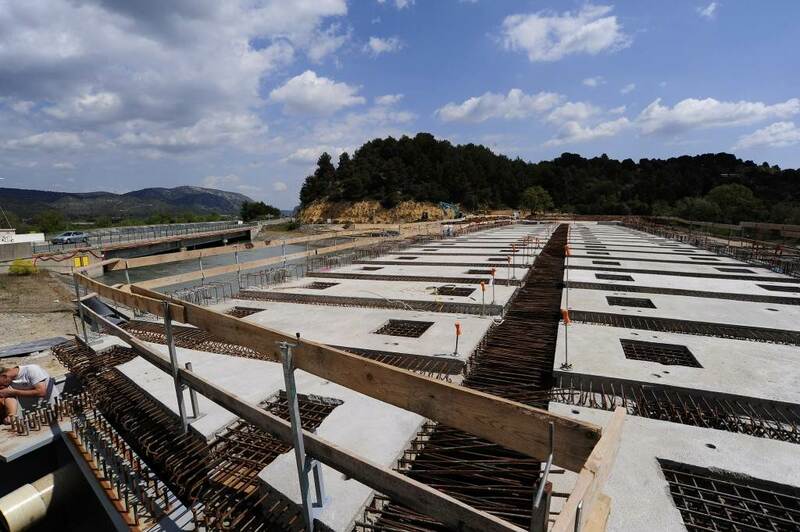 The first segments of the ITER cryostat—part of its base—will be the first machine components to reach the ITER site. 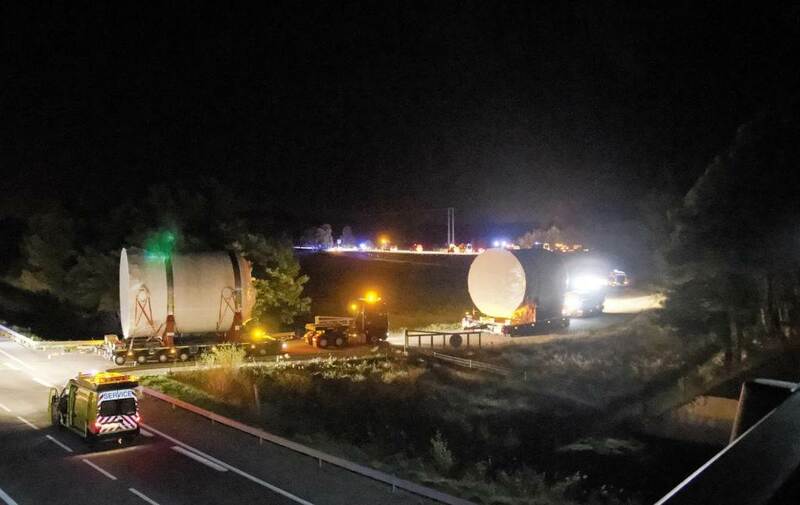 As part of their three-night journey to ITER, the drain tank convoy crosses the A51 highway twice. 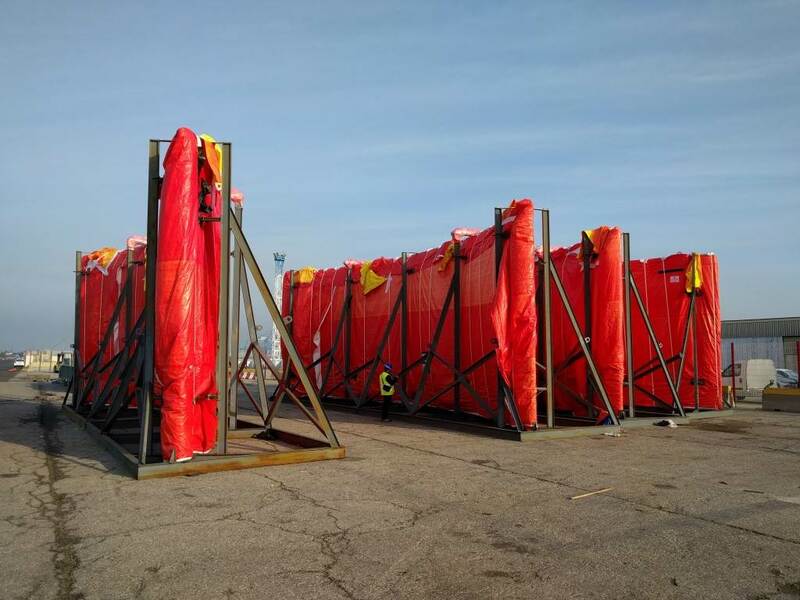 Five drain tanks shipped from the United States (two in May and three in September 2015) are now stored on the ITER site. 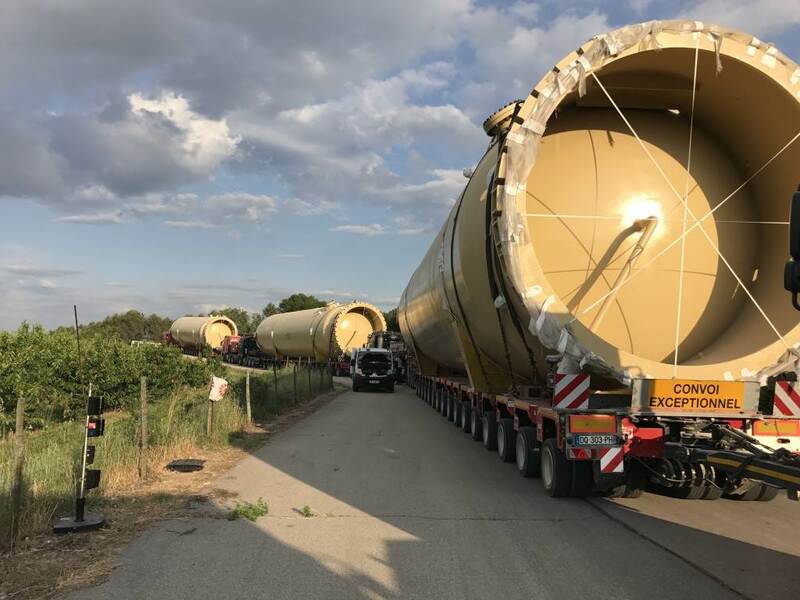 Three drain tanks for ITER's cooling water system will be transported along the ITER Itinerary this week for delivery to the project construction site. 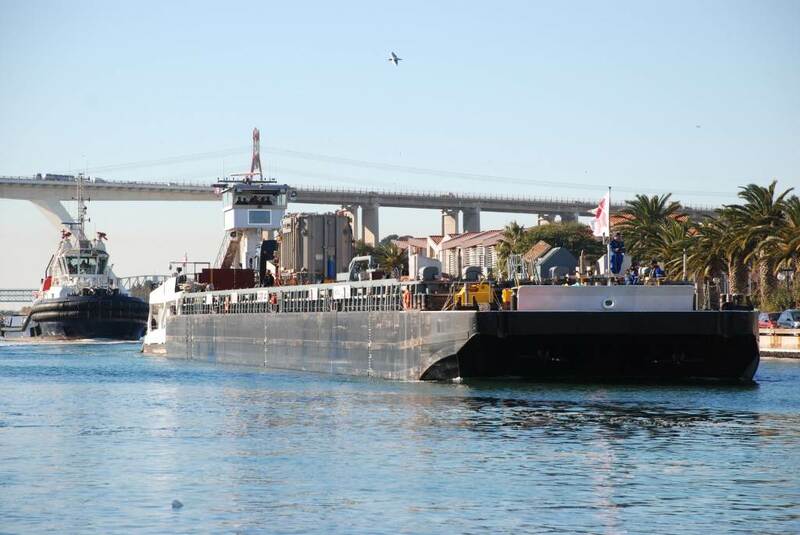 Part of the US contribution to ITER, the tanks completed the maritime segment of the trip on 9 September, crossing inland waterways by barge (photo: Ben Slee, F4E). 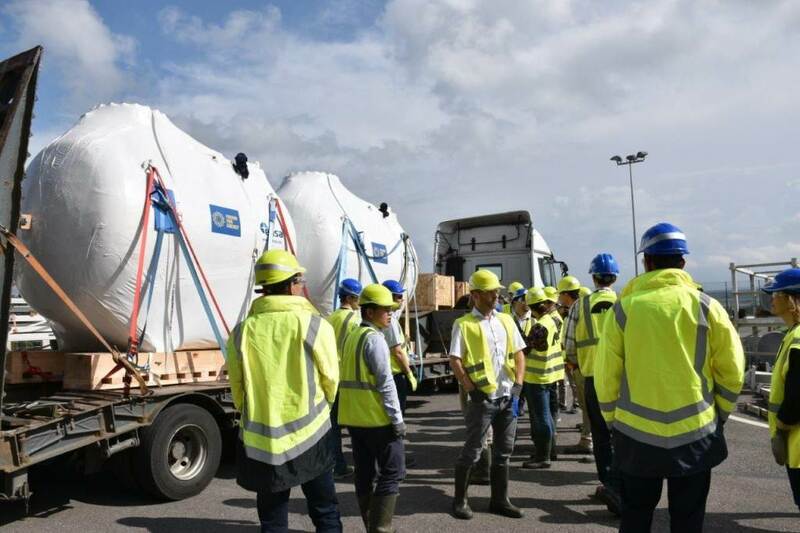 Large-scale components for ITER's tokamak cooling water system were unloaded in the French port of Fos-sur-Mer on 6 September. 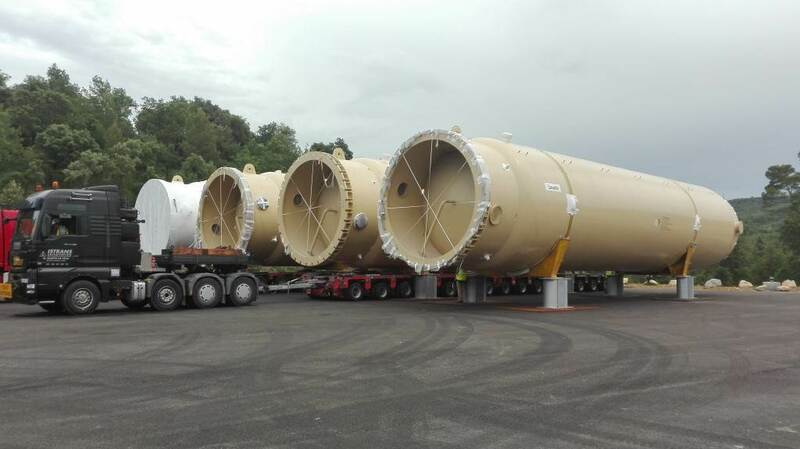 Procured and shipped by the US as part of its in-kind contributions to the project, the drain tanks will now travel along the ITER Itinerary to the site. 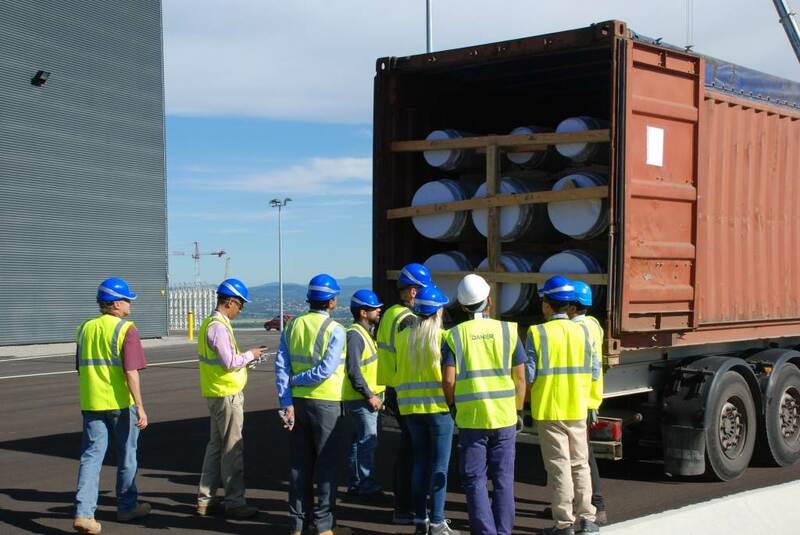 Less than one month after their shipment from India, 24 cooling water pipes are delivered to the ITER Organization in southern France on 2 September. 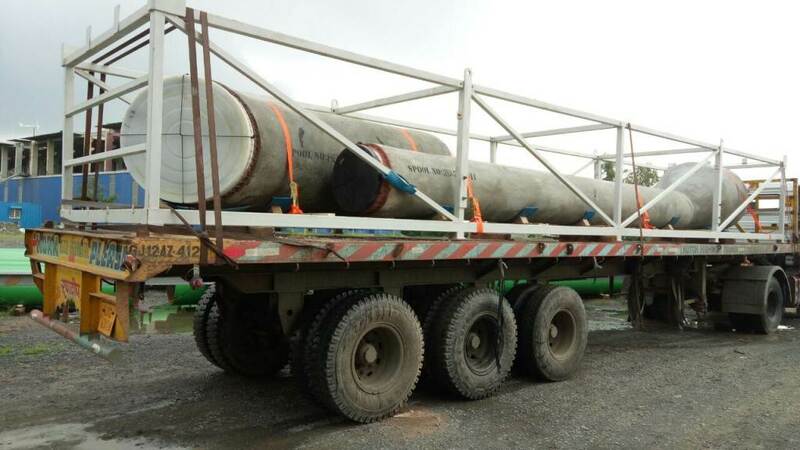 In early August 2015, two containers worth of cooling water piping (24 units) for ITER's chilled water and heat rejection systems were shipped from India. 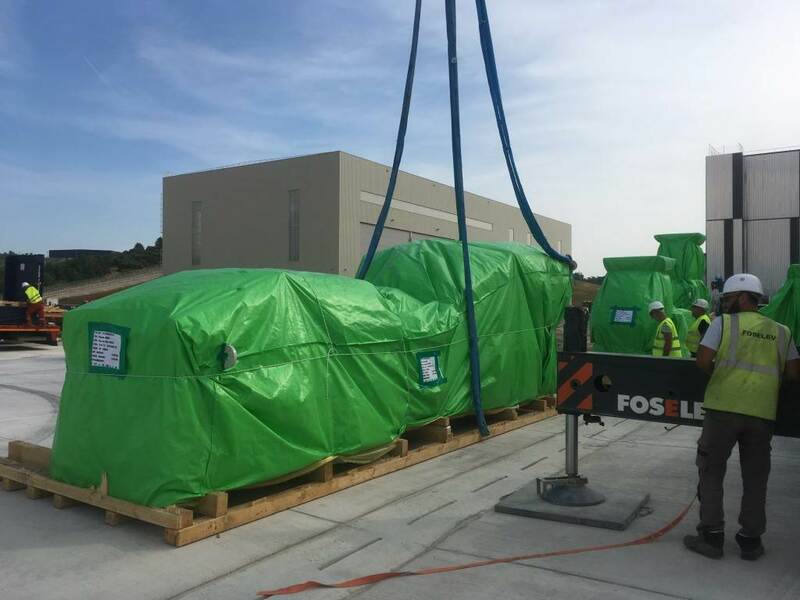 Three US-procured electrical tranformers are delivered to the ITER site early on 21 May 2015. 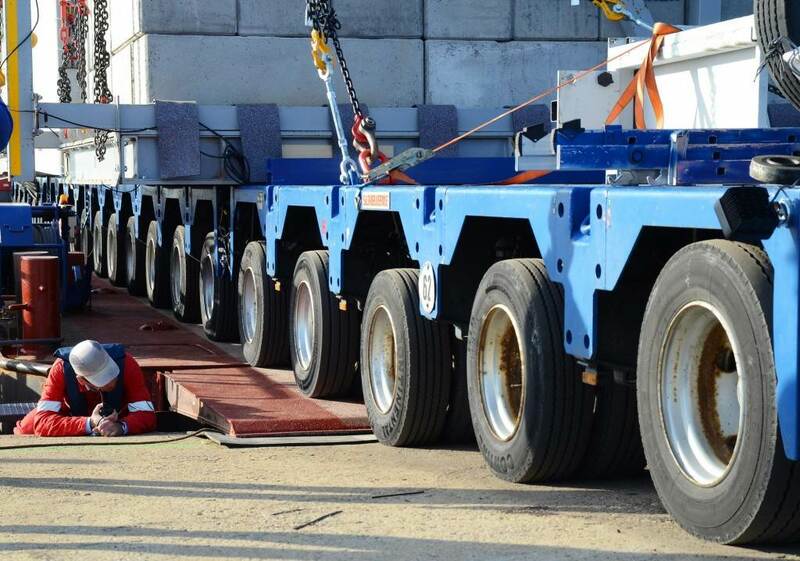 On 13 May, three US-procured transformers are loaded onto trailers to await transport to the ITER site. 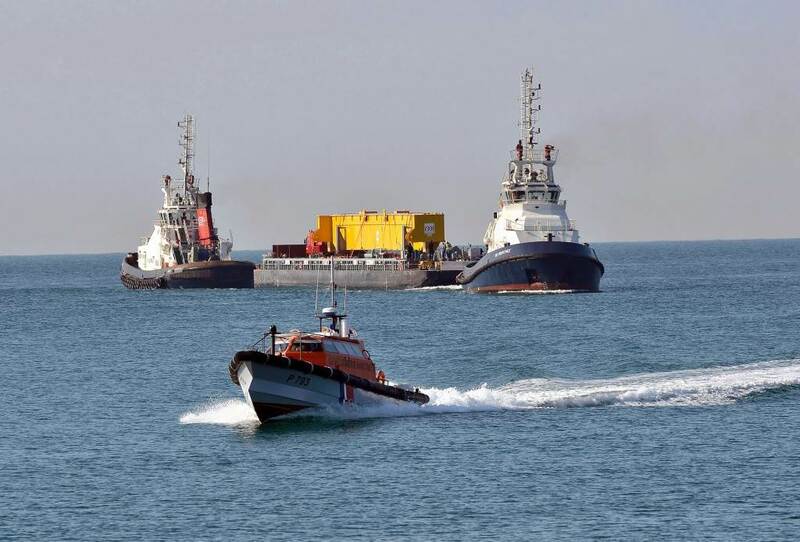 Two had just been unloaded from their ocean going vessel; a third had been in storage for one month. All three are expected at ITER on Thursday 21 May. 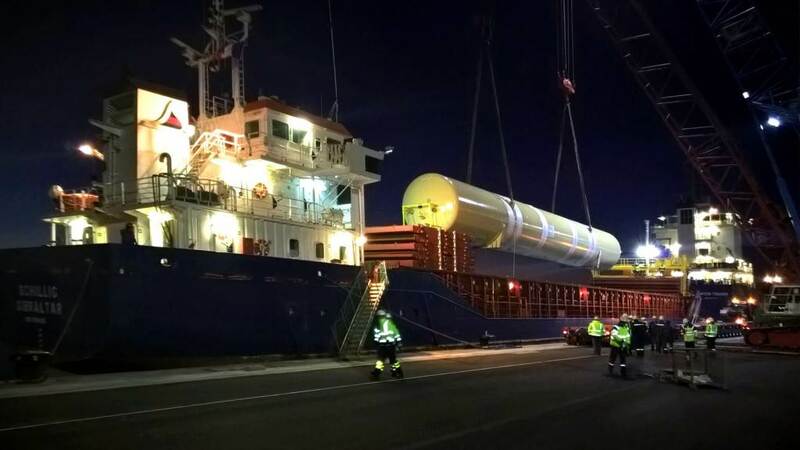 The first of five US-procured drain tanks for ITER's Tokamak Cooling Water System were unloaded from the container ship "BBC Zarate" on 26 April 2015. 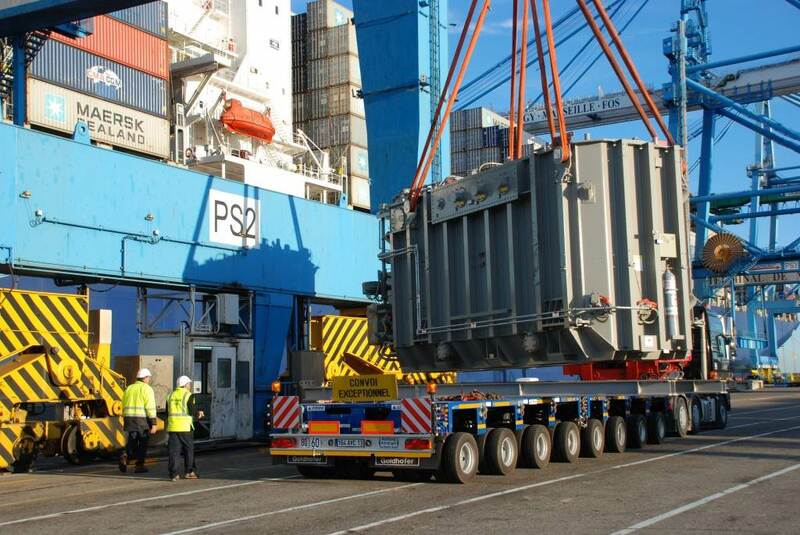 On Monday 20 April, an 87-tonne transformer was unloaded at the docks of Fos (Marseille). The second of four identical units, the transformer was procured by the US and manufactured in Korea. 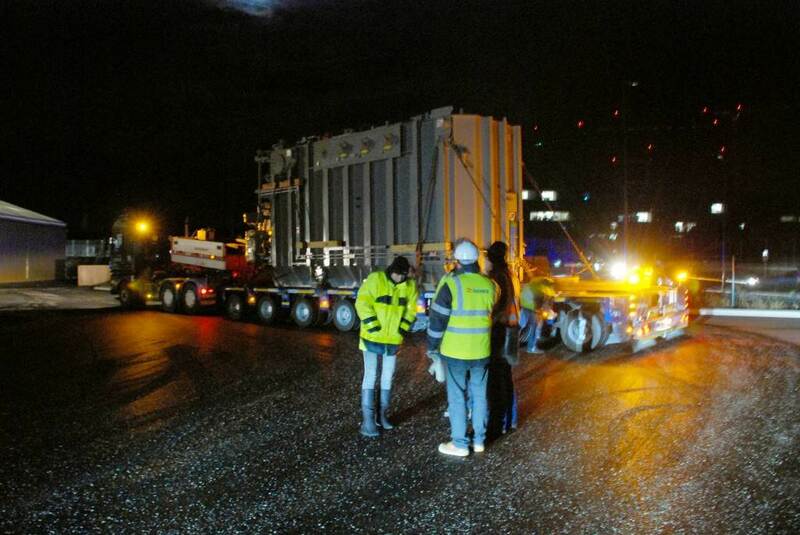 On 20 March, a 20-tonne, 100 m³ tank destined for the ITER detritiation system is delivered. 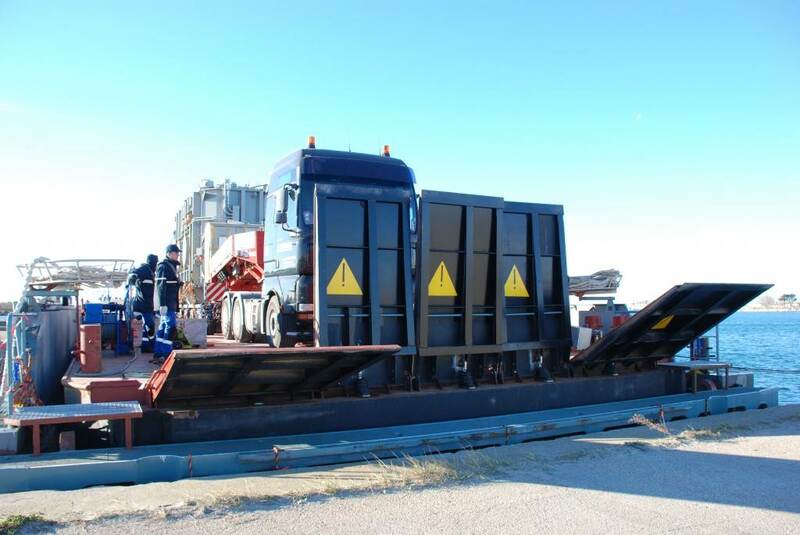 Manufactured by ENSA (Spain) and procured by the European Domestic Agency, it is one of two "emergency tanks" that will collect the tritiated water in case an abnormal situation develops during operations. 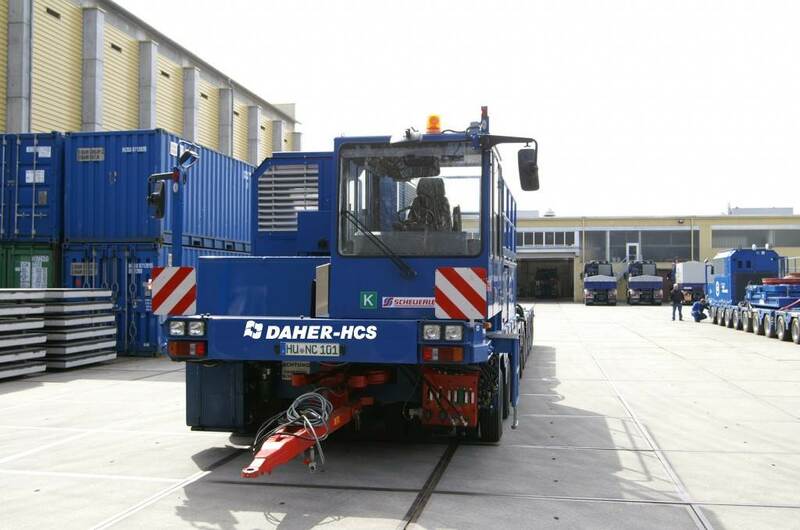 A second was delivered on 2 April. 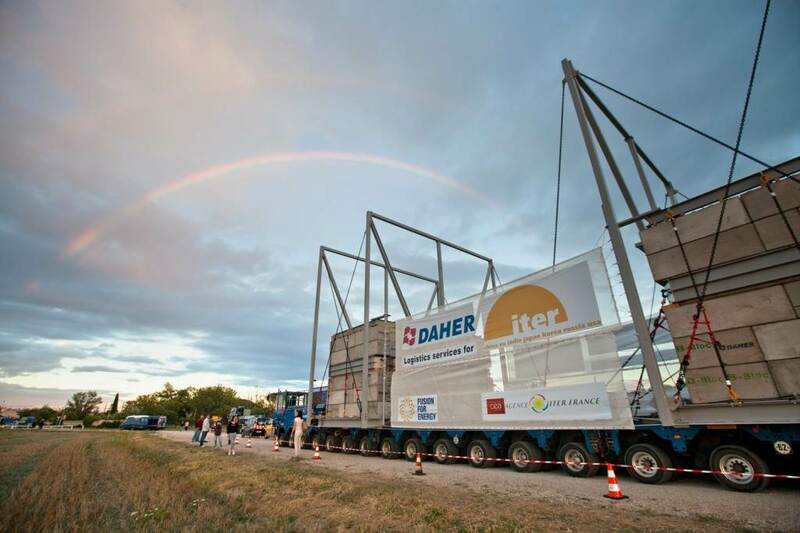 Everything went according to plan for ITER's first Highly Exceptional Load. Mission completed! 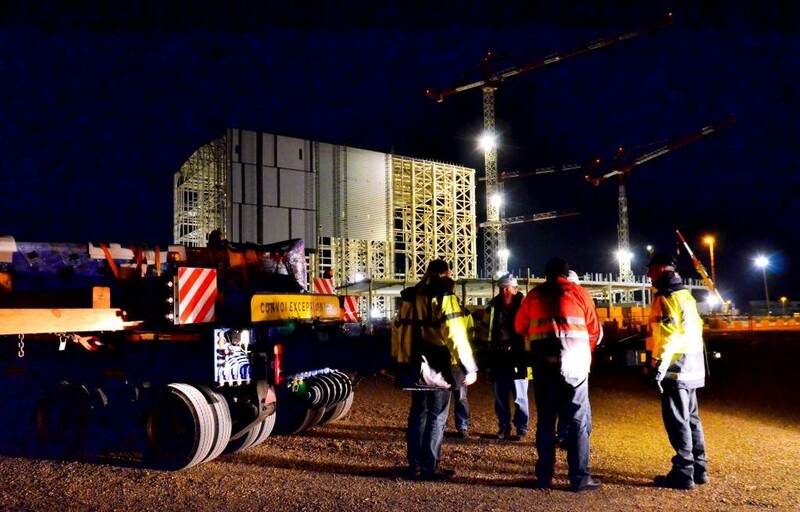 By 5:00 a.m. the transformer is safely parked at the ITER site and all participants can enjoy a hot - and well deserved - cup of coffee. The sun rises on 14 January over the ITER site and over the first Highly Exceptional Load to be delivered to ITER. 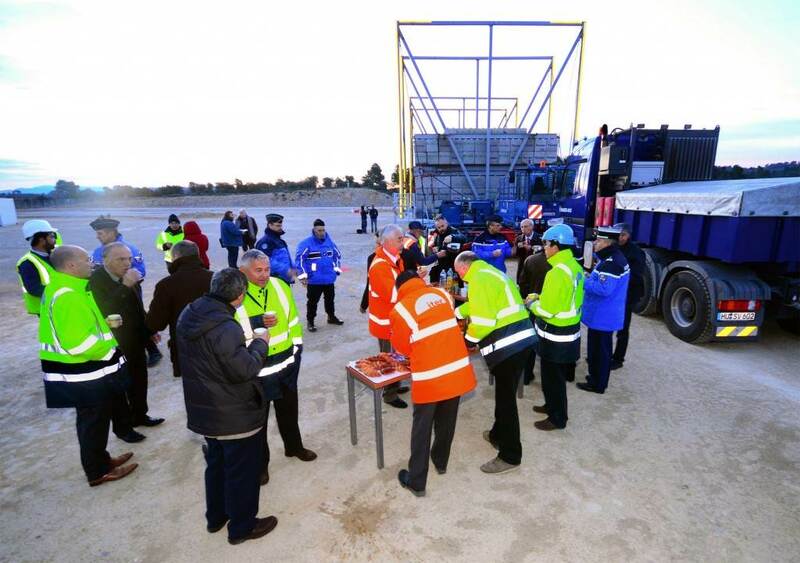 All had risen early: ITER senior management, the directors of several ITER Domestic Agencies, members of the ITER Electrical Engineering Division, and representatives of Agence Iter France and DAHER. 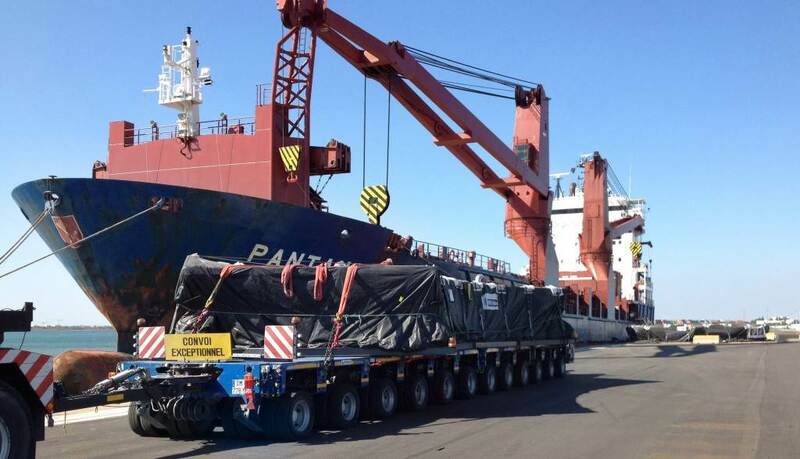 After 60 days on high seas and on the road, the 87-tonne transformer has arrived at its final destination. 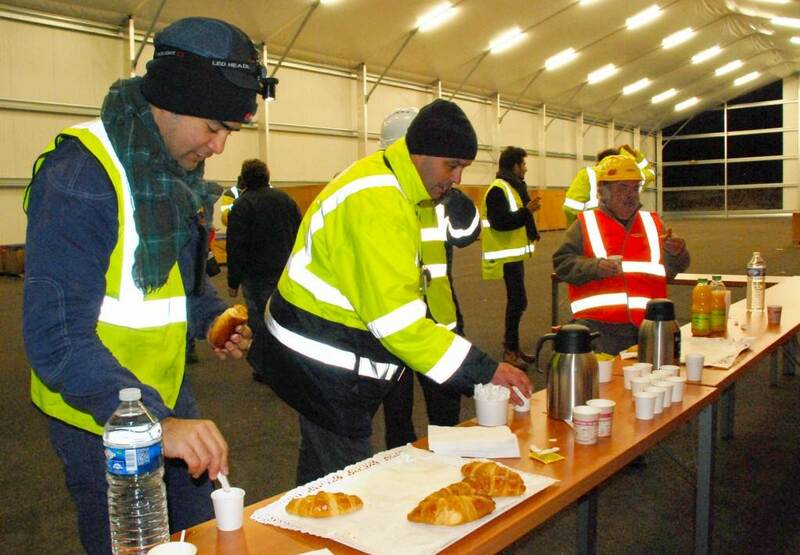 To guarantee the safety of the convoy and ensure that all operations go smoothly, over 100 people participated: representatives of ITER; DAHER (the ITER Logistics Service Provider); Agence Iter France; and French authorities. 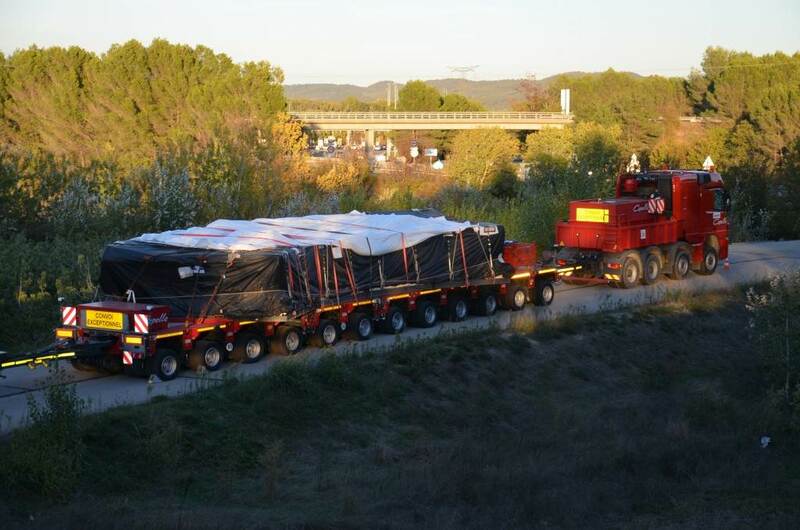 Together with the trailer, the first exceptional convoy for ITER weighed 126.8 tonnes and measured 20 m (length) x 3.35 m (width) x 5 m (height). 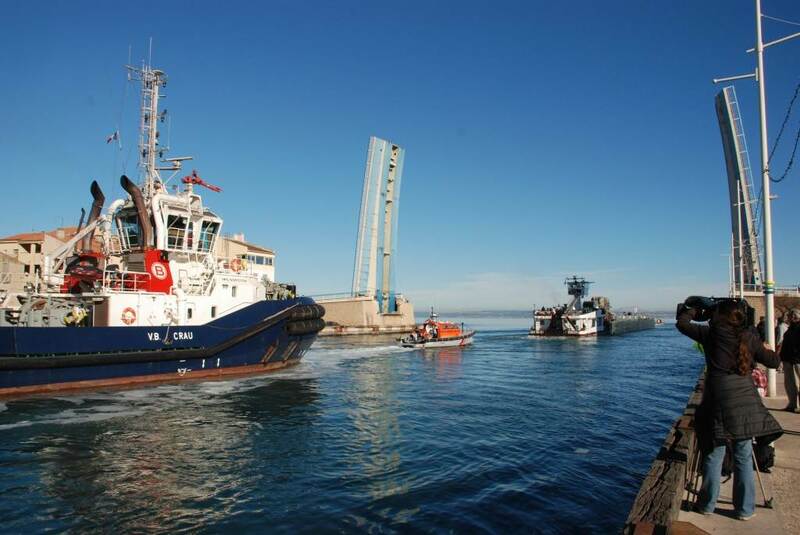 The weather conditions could not have been better when the barge "Scirocco" left the docks in Fos-sur-Mer. Cast off! 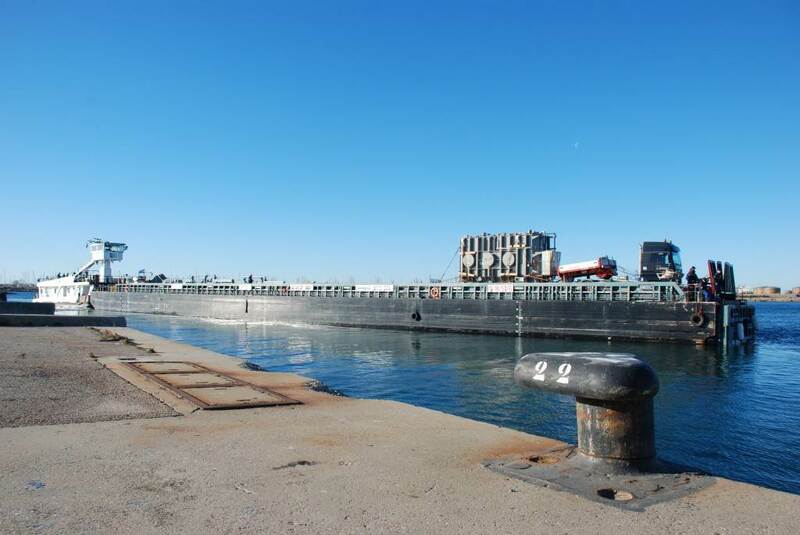 The barge "Scirocco" with its precious cargo is getting ready to sail. 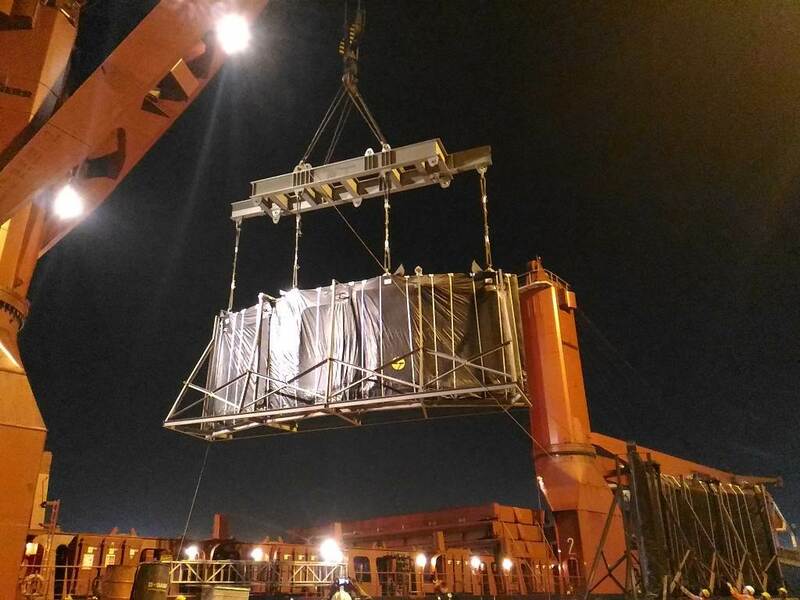 The transformer is loaded onto a specially adapted barge for the crossing of an inland sea. 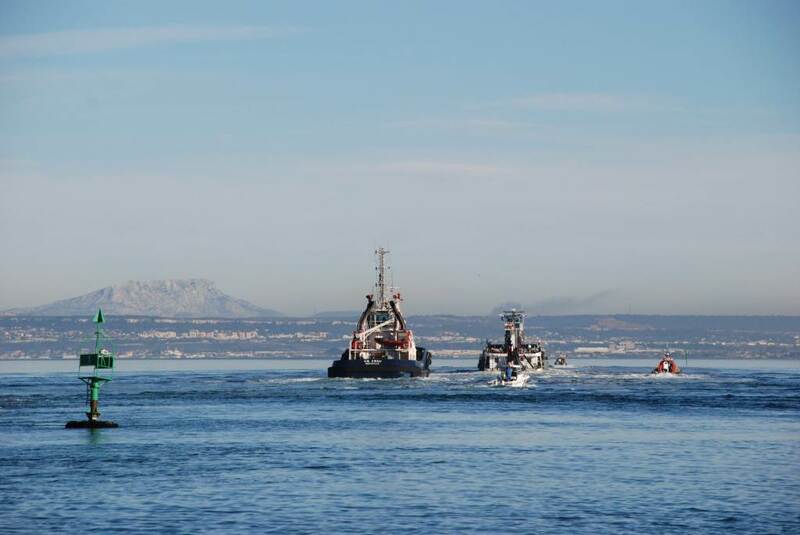 The crossing of the Berre d'Etang was the last leg of the transformer's sea voyage. From there, continued on wheels. Exceptional loads, exceptional measures! 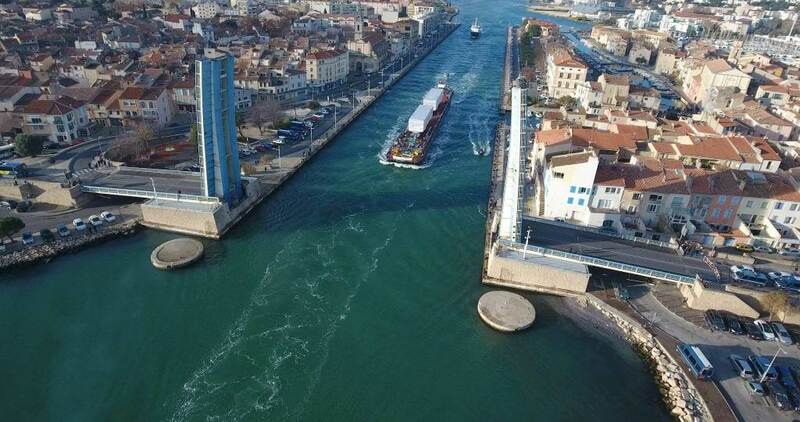 Traffic was stopped when the bridge in Martigues opened to allow for the crossing of the ITER convoy. 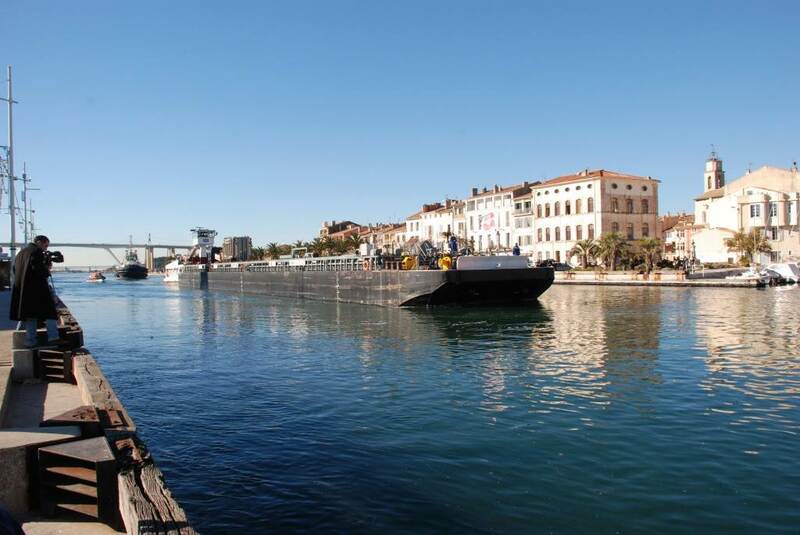 The pictoresque town of Martigues was the setting for the first leg of the first Highly Exceptional Load transport convoy for ITER Project. 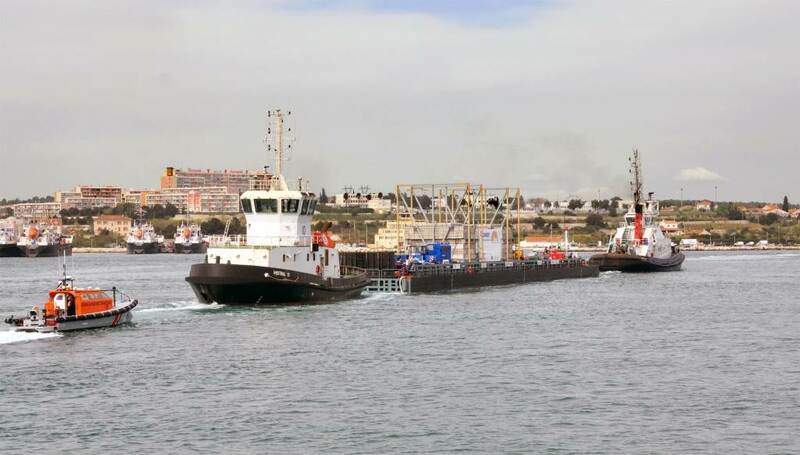 It was a spectacular sight as the barge with its special cargo made its way through the Canal de Caronte. 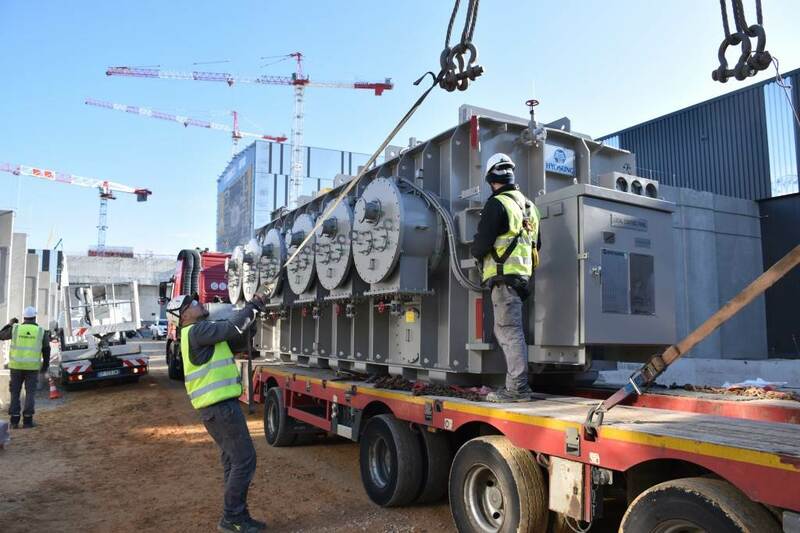 The first of four high voltage transformers for ITER's steady state electrical network arrives in Fos-sur-Mer (near Marseille, France) on 19 December 2014. 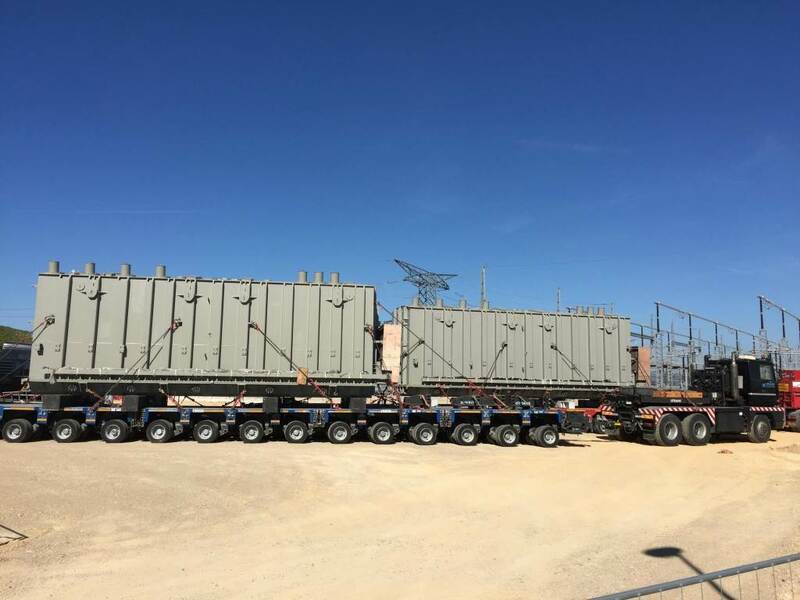 The four transformers, part of the US contribution to ITER, are being supplied under contract with Hyundai Heavy Industries, LLC in Korea. 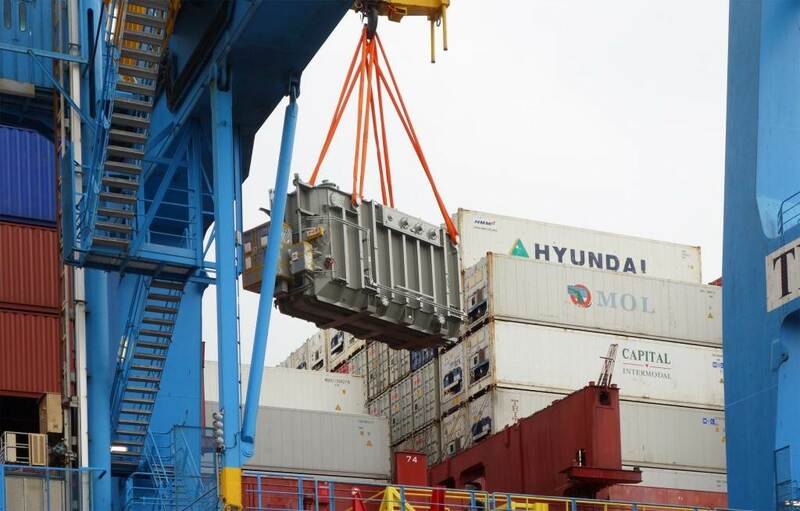 The 87-tonne transformer was lifted out of its "cabin" on the "CMA CGM IVANHOE" after a one-month voyage from Korea. The docks in Fos-sur-Mer, the industrial port of Marseille. 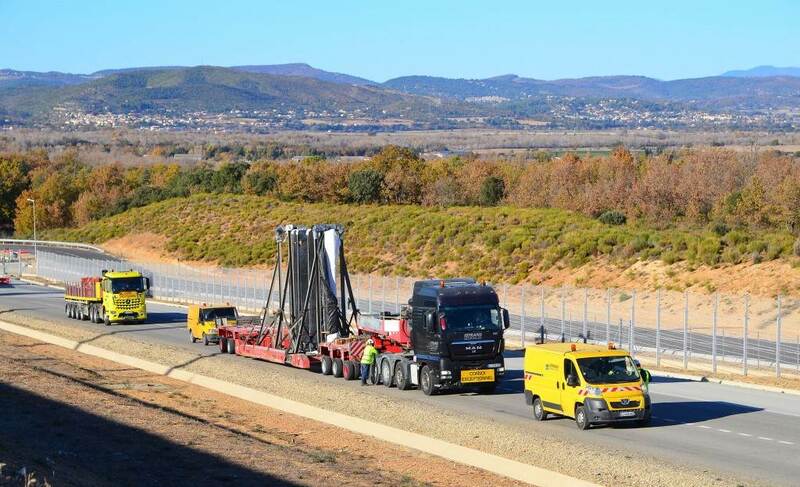 It is here where the large and heavy components for ITER will arrive and embark on their final journey to the ITER site. 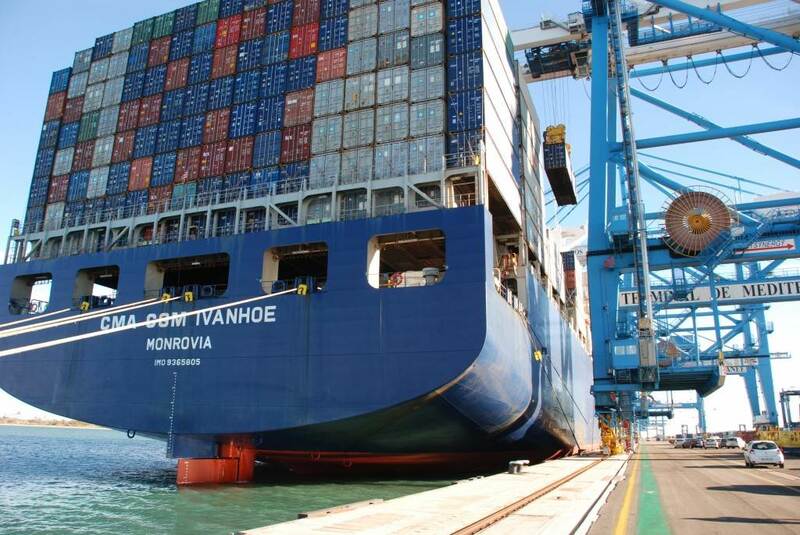 The "Ivanhoe", an oceangoing vessel capable of carrying more than 10,000 containers, delivered the transformer from the Korean shores to France. 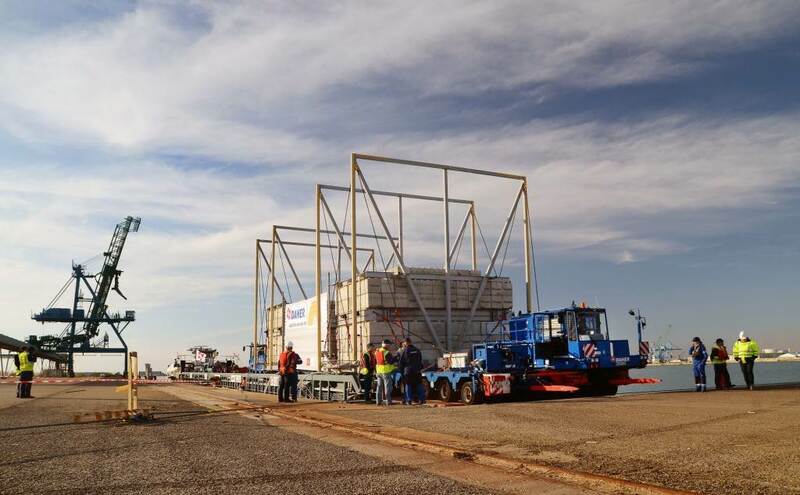 Four wooden crates containing the first completed components for the ITER installation arrive on site on 4 September 2014. Destined for the steady state electrical system, the 12 high voltage surge arrestors will be stored temporarily in the Poloidal Field Coils Winding Facility. 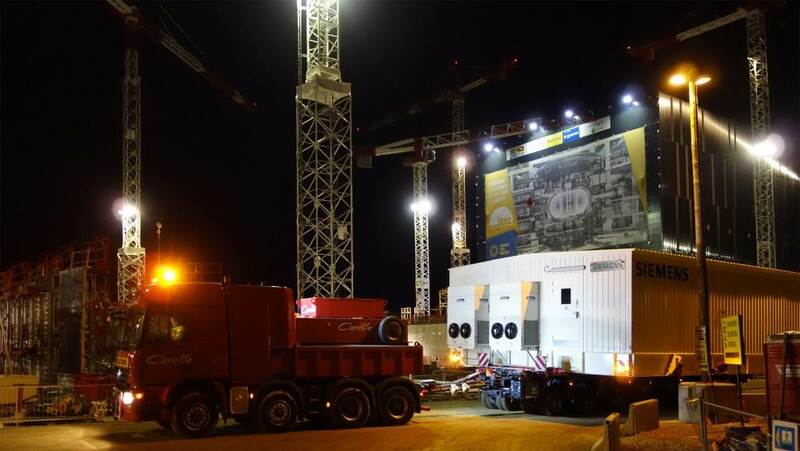 After several technical incidents, the 800-tonne trailer and dummy load reach the ITER site a few hours ahead of schedule on 8 April 2014. Convoy actors share a well-deserved cup of coffee as the sun comes up. 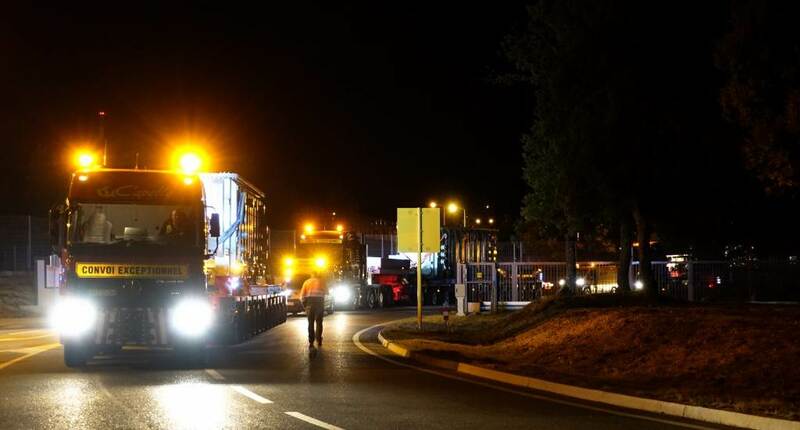 The ITER convoys progress only at night (at not on weekends or holidays) in order to limit the disturbance to the local communities. 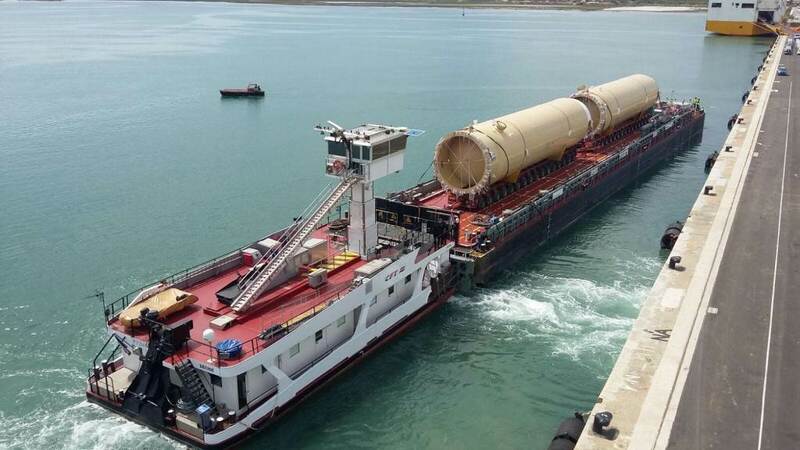 The convoy—the barge, 800-tonne trailer and dummy load, and tugboats—will take four hours to cross the Étang de Berre. 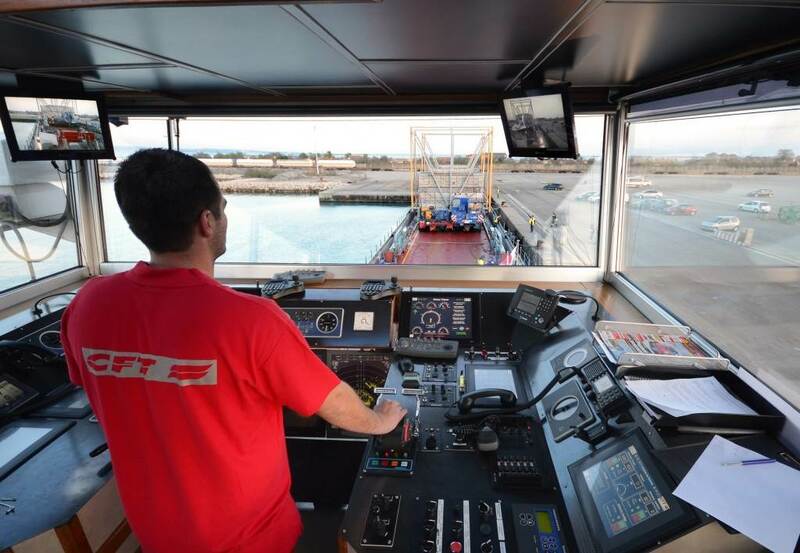 From the tug's elevated wheelhouse the captain navigates from the Gulf of Fos, through the narrow Canal de Caronte and across the inland Étang de Berre on 31 March 2014. 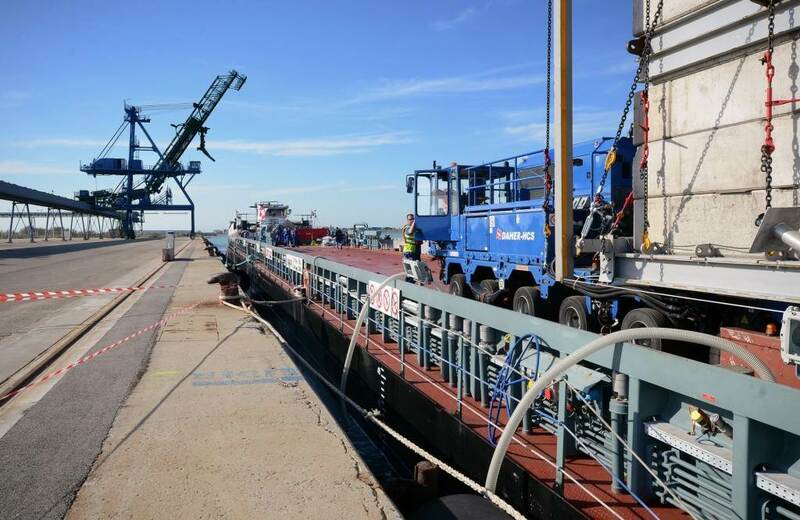 Personnel from ITER logistics provider DAHER and the Compagnie Fluviale de Transport monitor every millimetre of progress as the trailer crossed onto the barge. 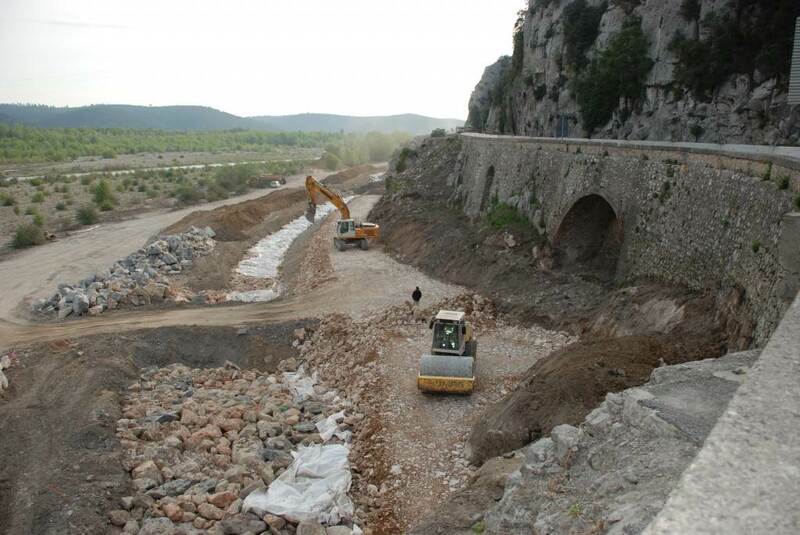 The operation takes about eight hours due to long pauses marked after the transfer of each double pair of axle lines (22 in all). 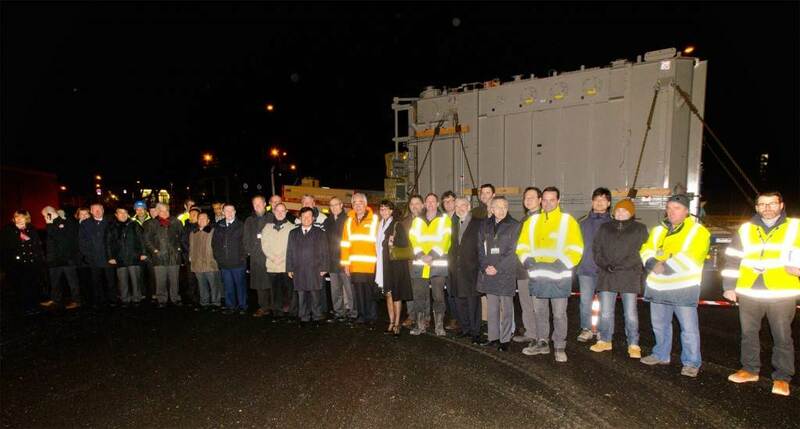 On 28 March 2014, the second ITER Itinerary test convoy gets underway. This time, the Itinerary test includes a maritime leg. 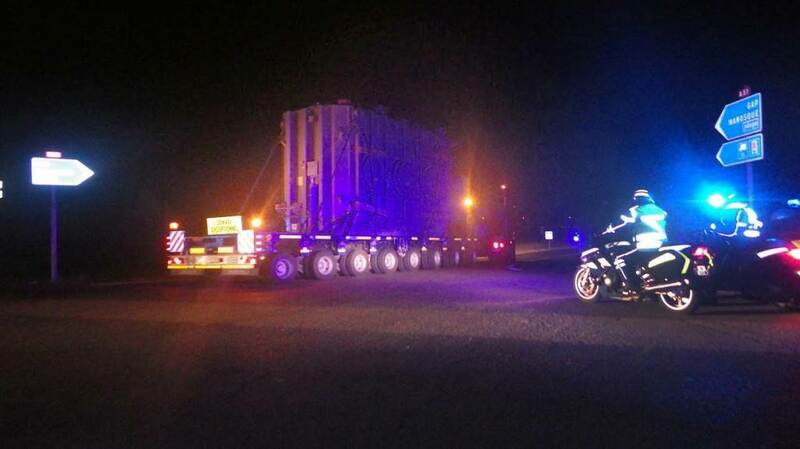 The convoy has accomplished its mission and dismantling operations begin shortly after arrival on site. 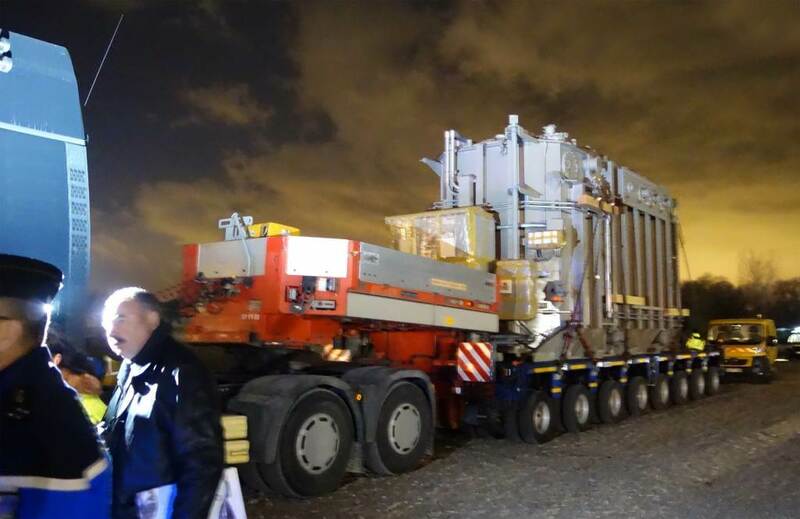 The dismantling of the mock load (360 concrete blocks) and the 352-wheel trailer will last for two days. Just in time to see a rainbow! 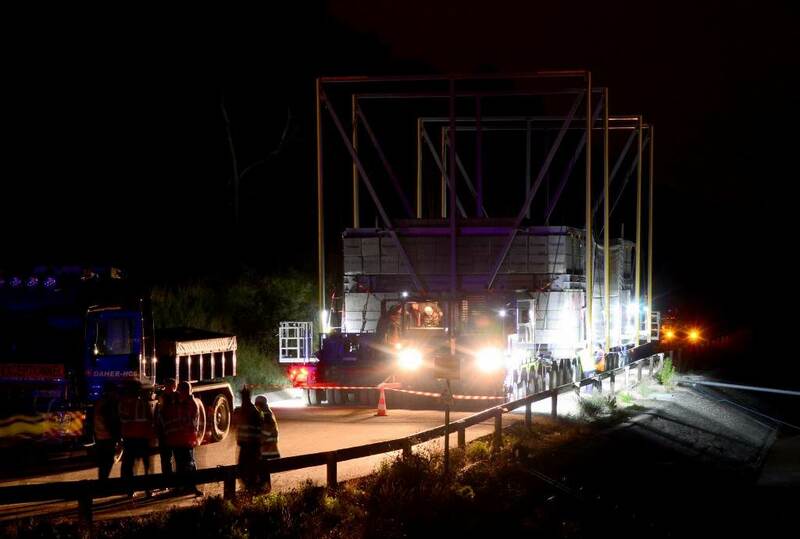 The four-night measurement campaign of the ITER Itinerary got off to a start on Monday 16 September. 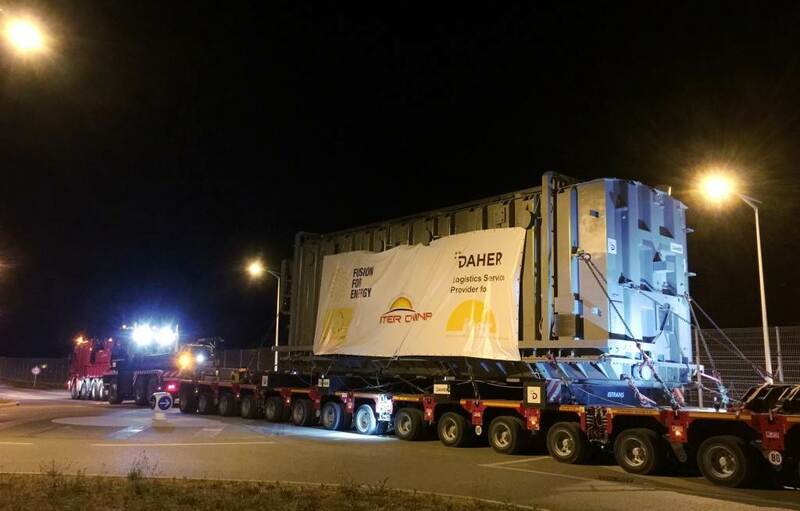 The 800-tonne trailer, mimicking the weight and dimensions of the largest ITER loads, travelled for four consecutive nights to reach the ITER site. 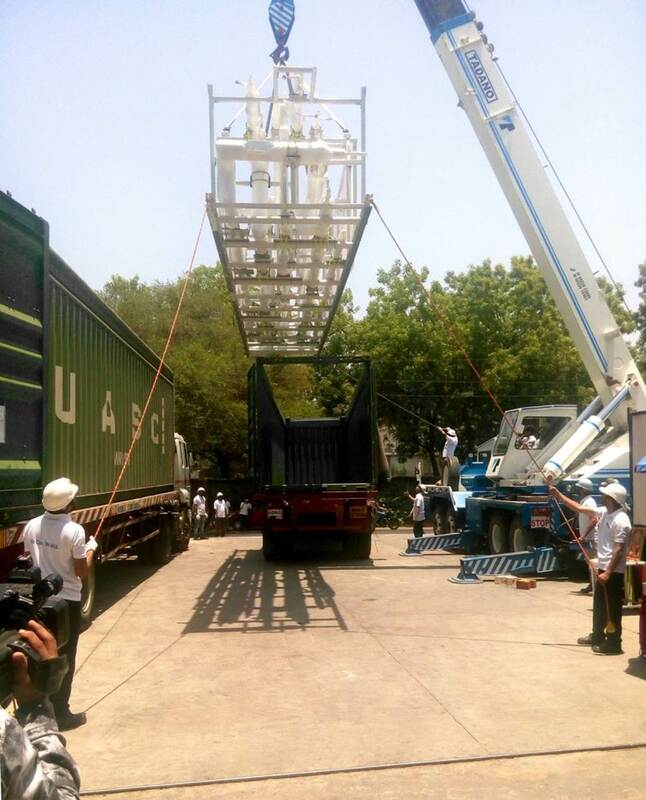 The 46-metre-long trailer and dummy load were conceived to test key points of the Itinerary. In four nights, measurements were taken at bridges, roundabouts and in 16 villages. For the most exceptional convoys, the vehicle will travel at an average speed of 5 km/hour, over 3-5 nights. 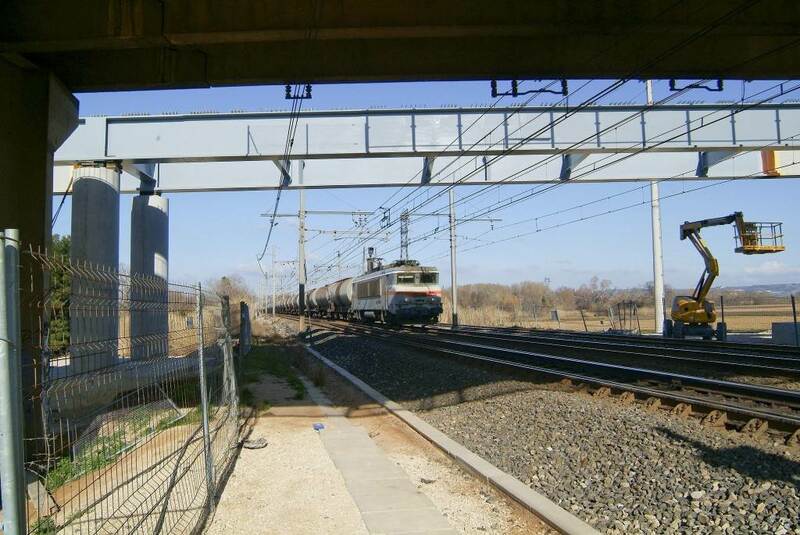 Between Berre and La Fare-les-Oliviers, ITER convoys will pass over the railway tracks. 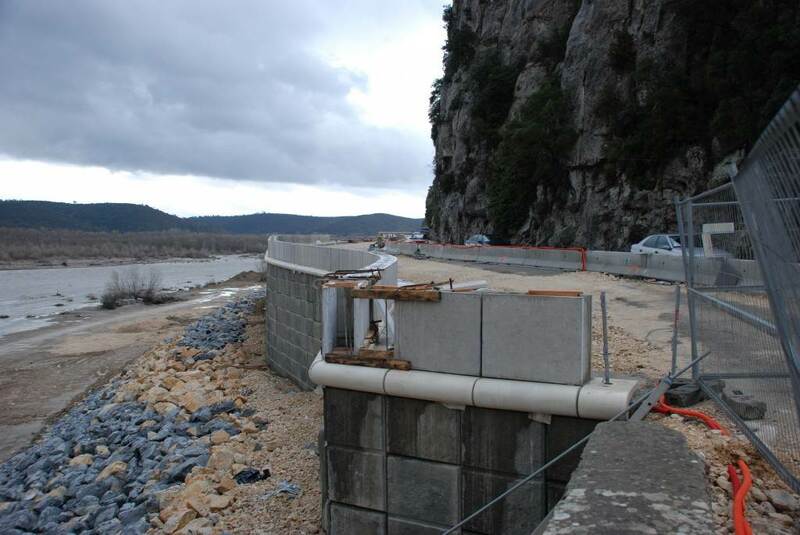 The bridge over the Réal River in Peyrolles. 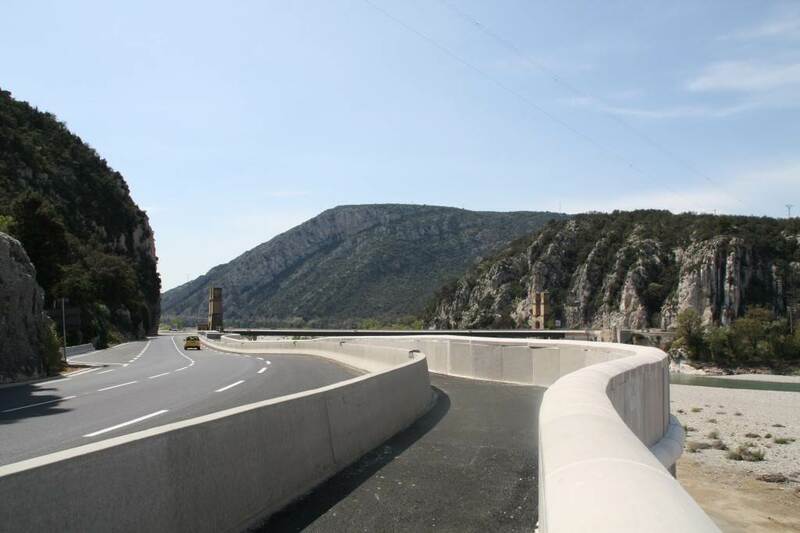 Along the ITER Itinerary the convoys will bypass 16 villages, negotiate 16 roundabouts and cross 35 bridges. 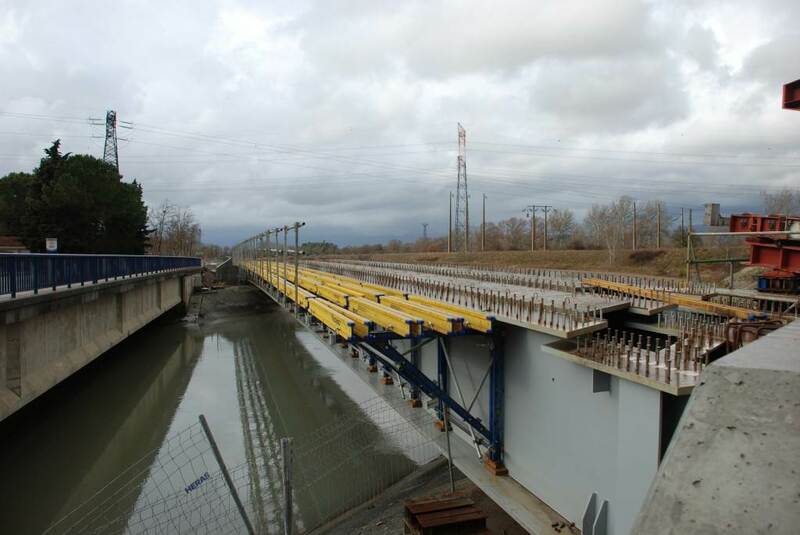 A brand-new bridge crosses the Canal de Provence in Peyrolles. 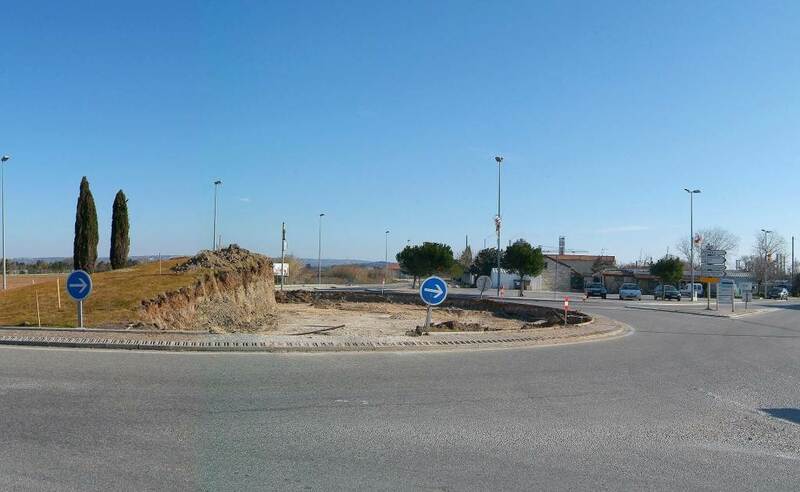 In Berre, a roundabout is levelled in order to allow for the passage of ITER convoys. 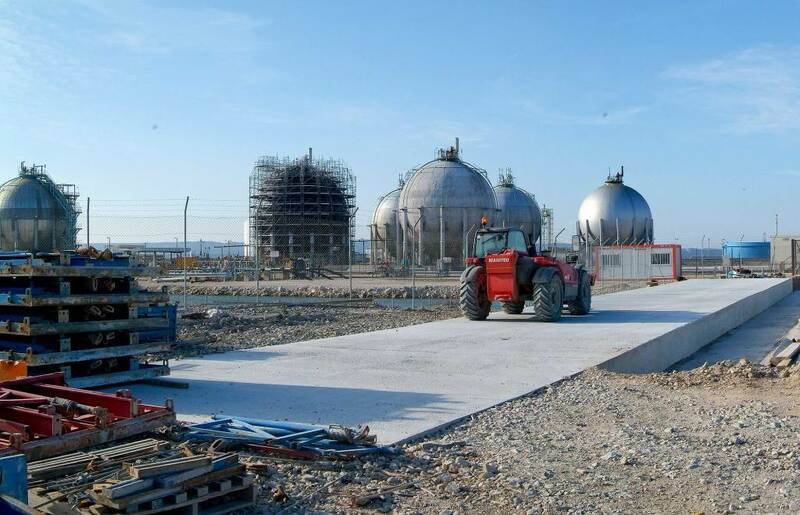 La Pointe harbour, where ITER components will be unloaded after crossing the Étang de Berre by barge.